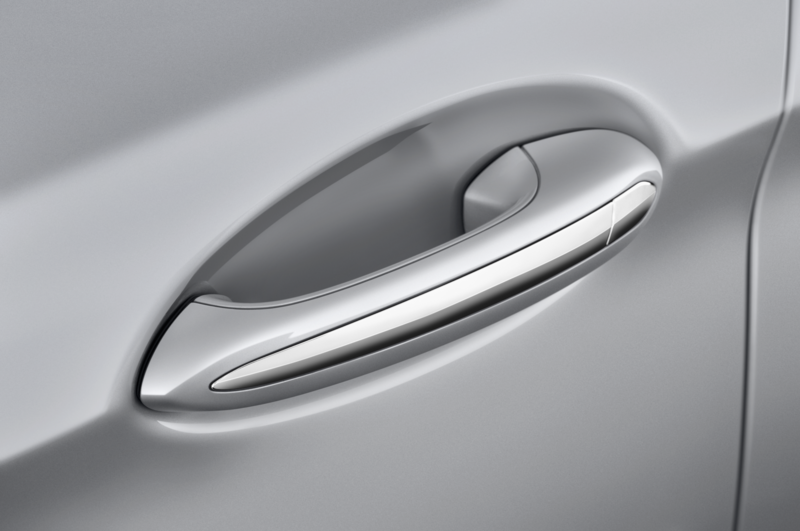 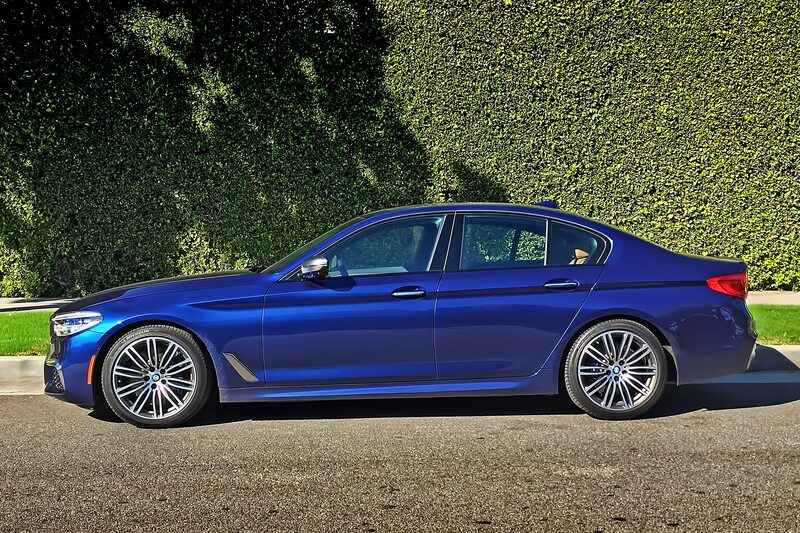 Every so often, I slip into a new automobile and feel like … it gets me. 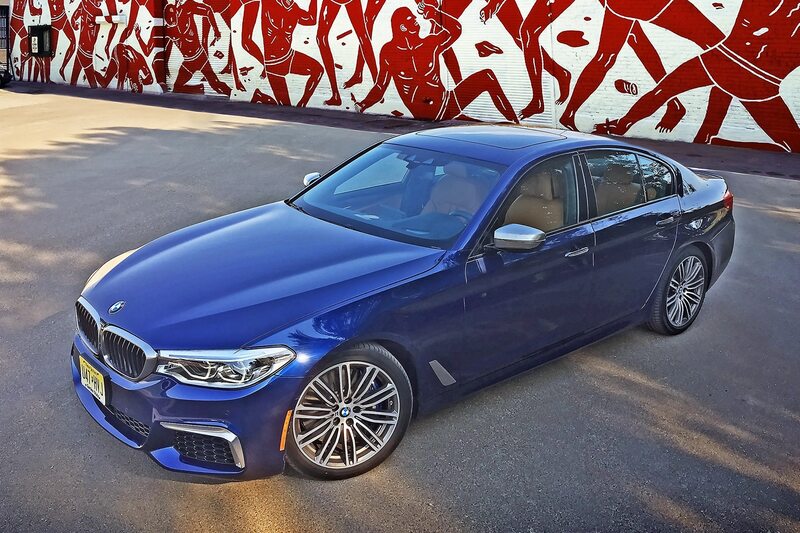 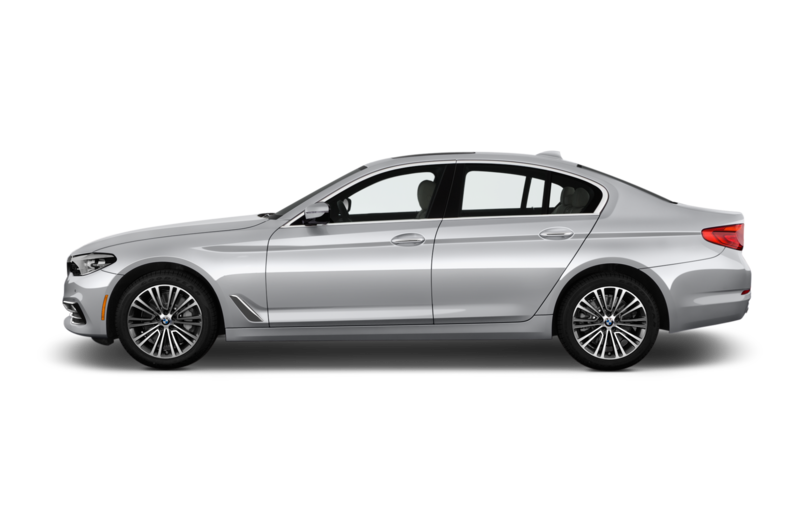 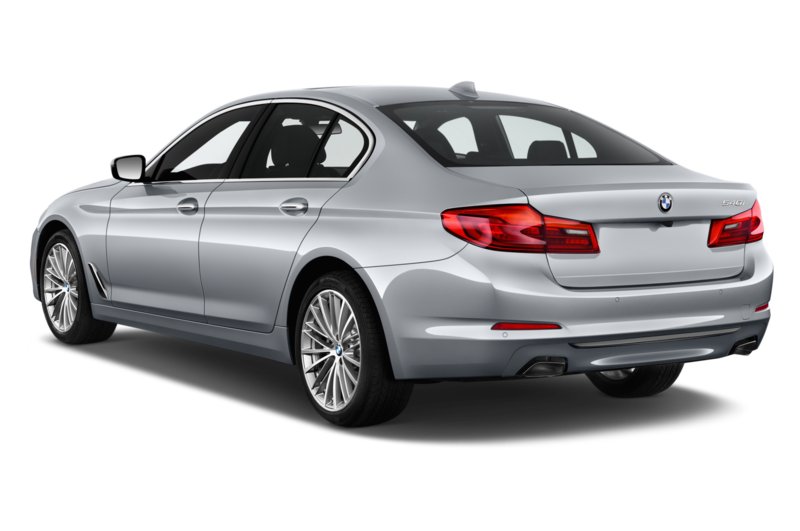 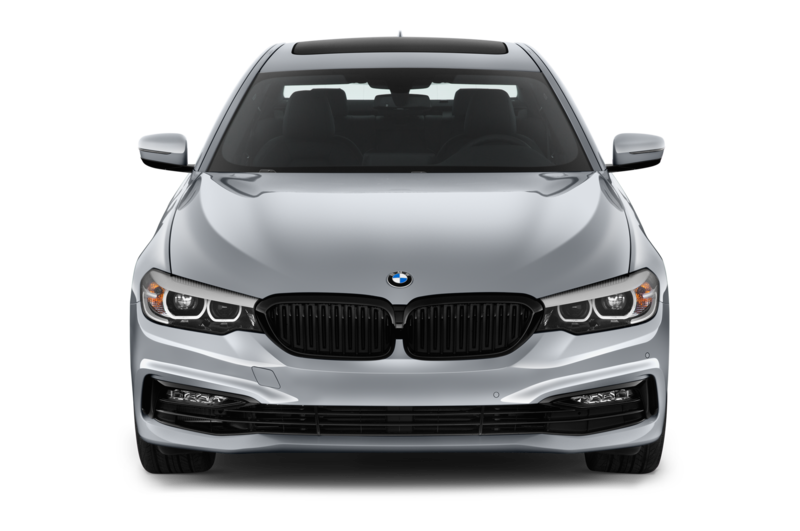 The new 2018 BMW M550i xDrive is such a car. 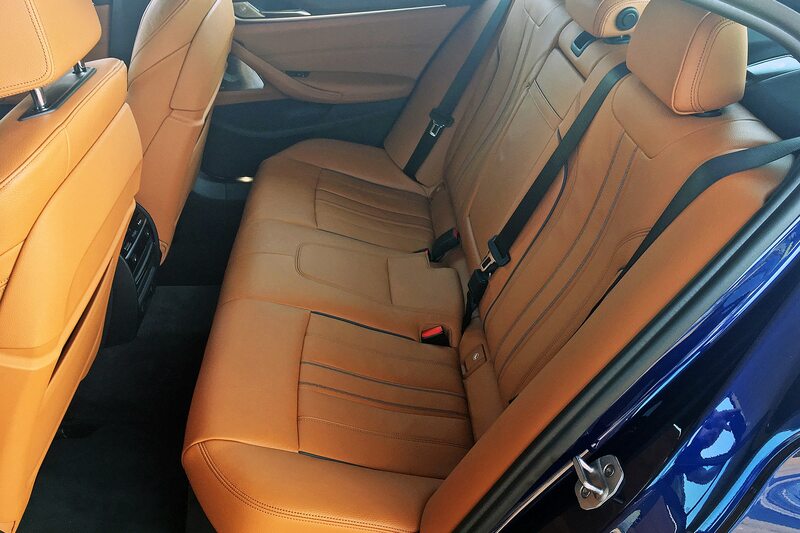 The moment I climbed into its Cognac Dakota leather 20-way power driver’s seat, I felt at home. 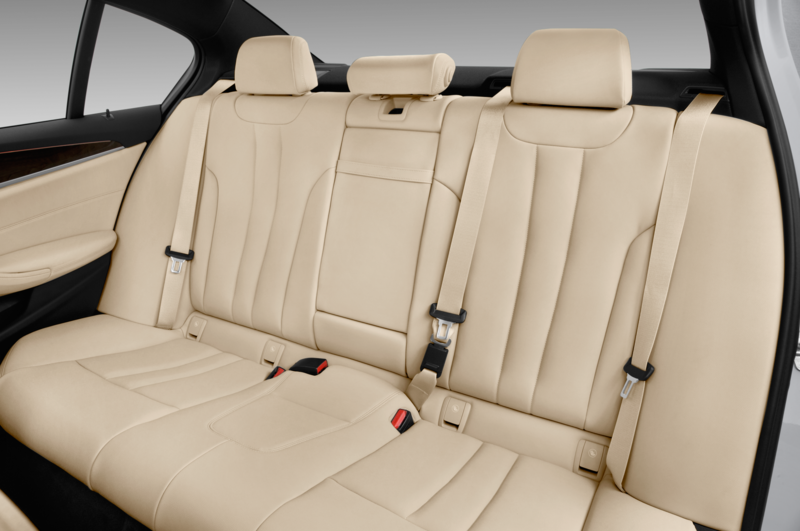 The headrest was a soft cloud cradling my cranium. 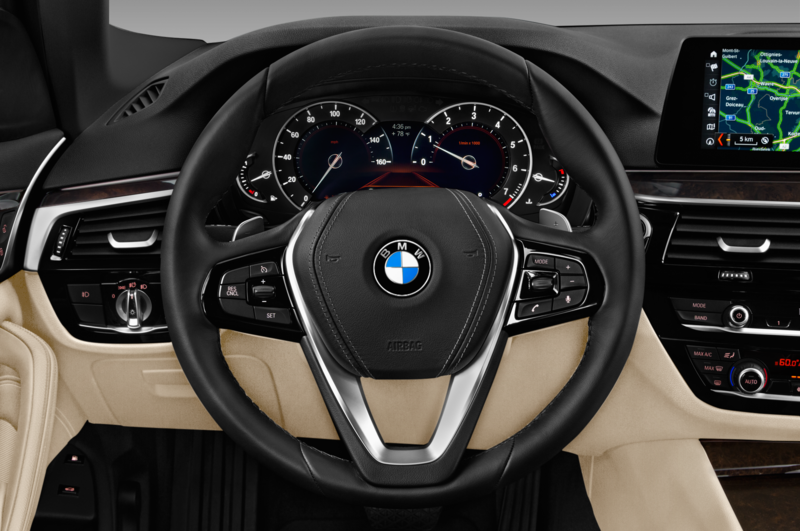 The beefy three-spoke M Sport steering wheel fit my hands just-so. 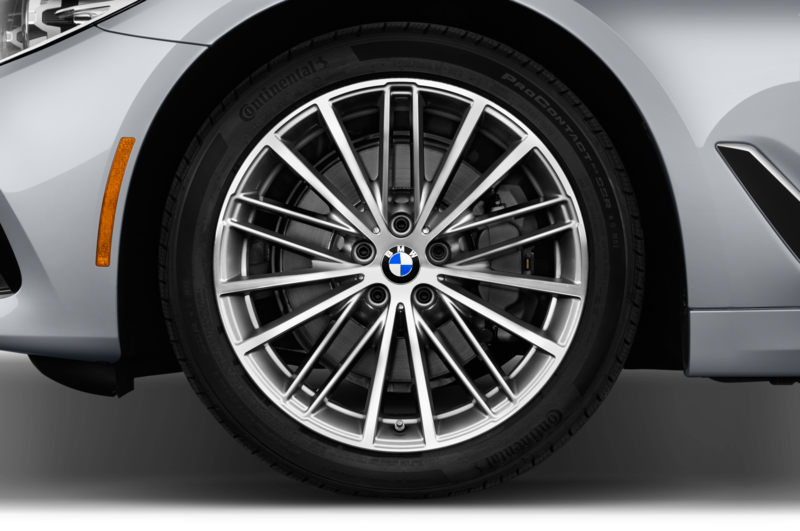 A large aluminum dead pedal provided a sturdy anchor for my left foot. 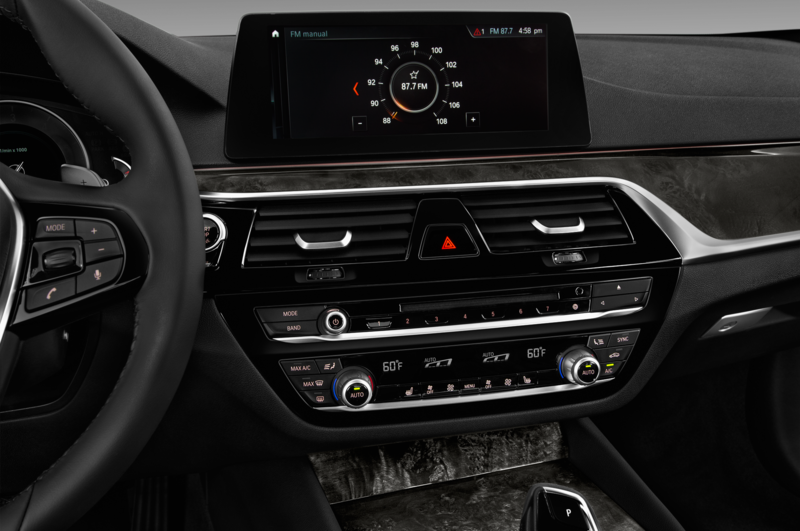 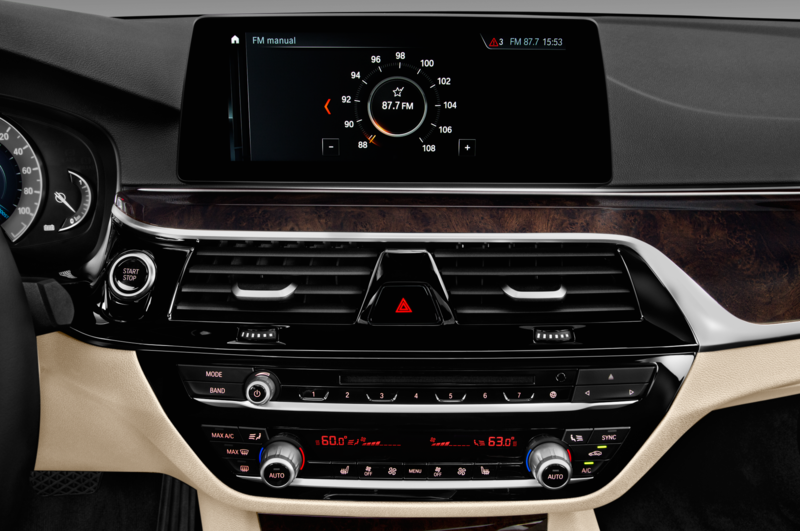 The various gauges and controls—shifter, iDrive 6.0 controller, 10.2-inch high-res touchscreen, optional head-up display ($1,700)—were all within easy reach and/or clearly visible. 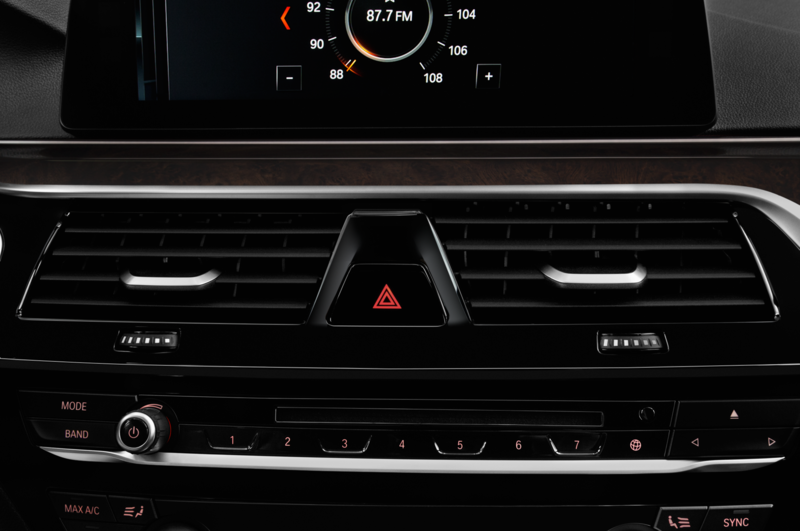 Already I was nodding approvingly at this new Bimmer—and I hadn’t even pressed the starter button yet. But when I did … look out. 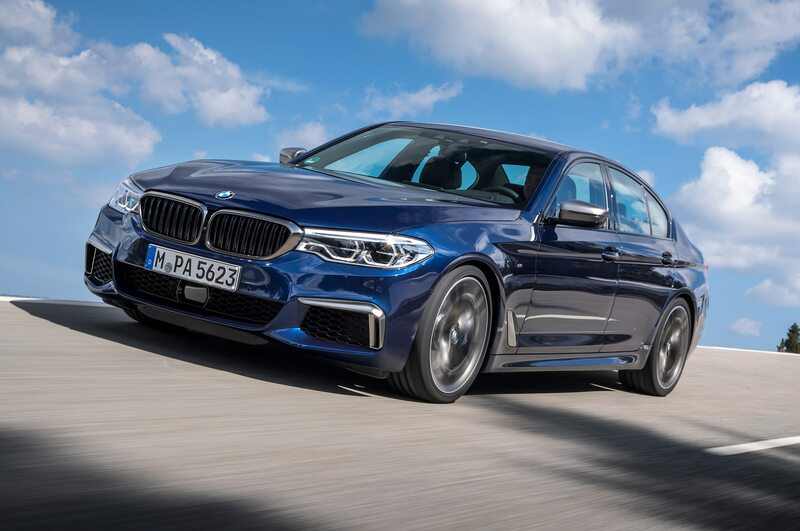 Until the all-new, 600-horsepower M5 arrives this spring, the M550i gets to boast that it’s the fastest 5-Series ever made. 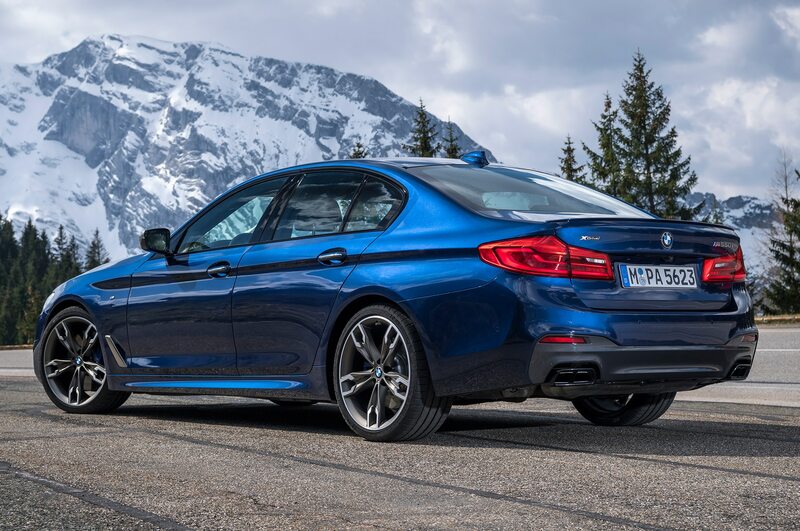 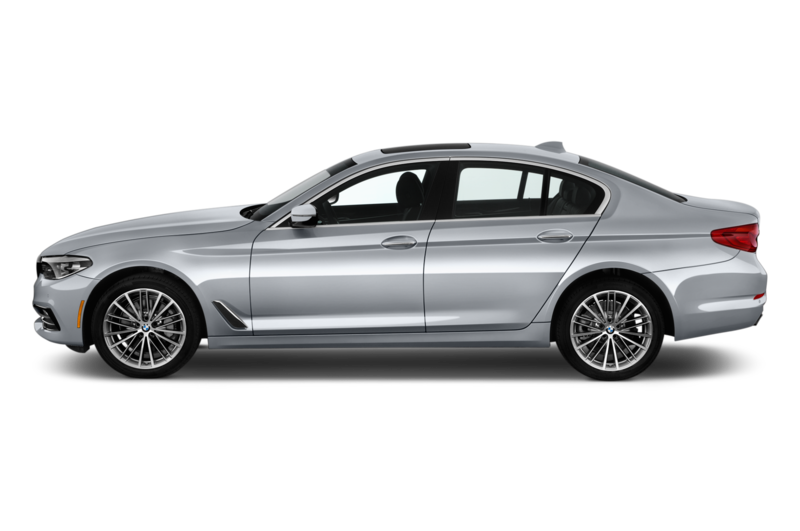 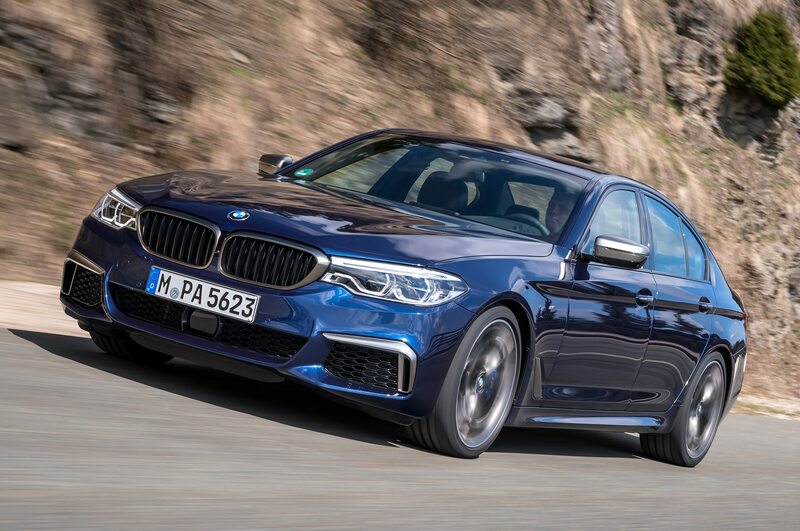 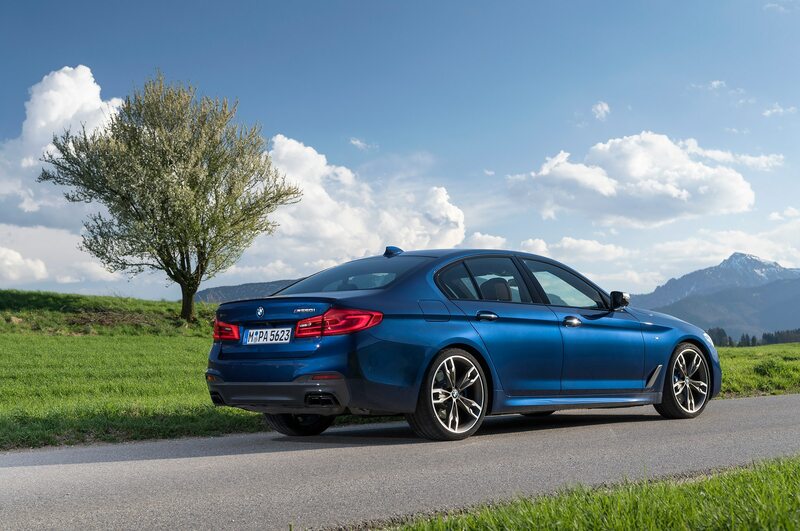 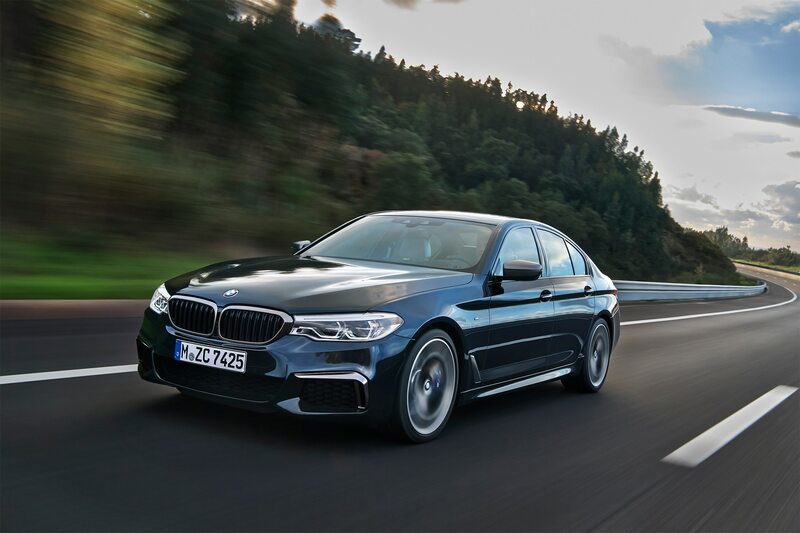 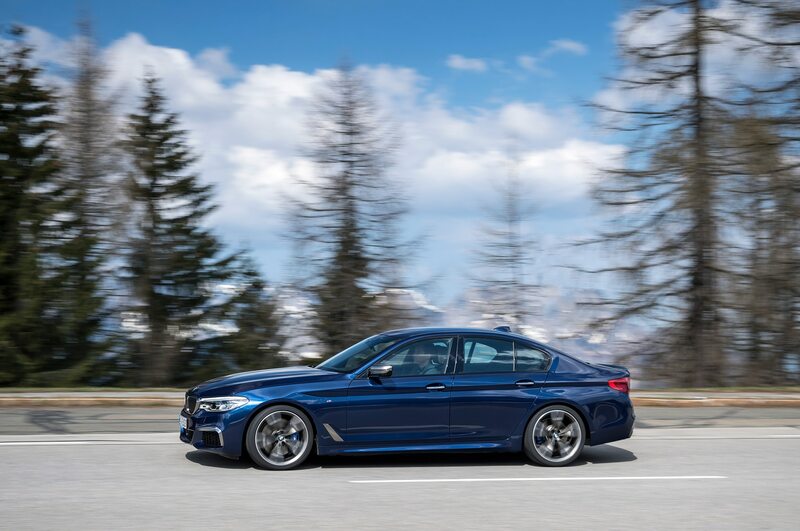 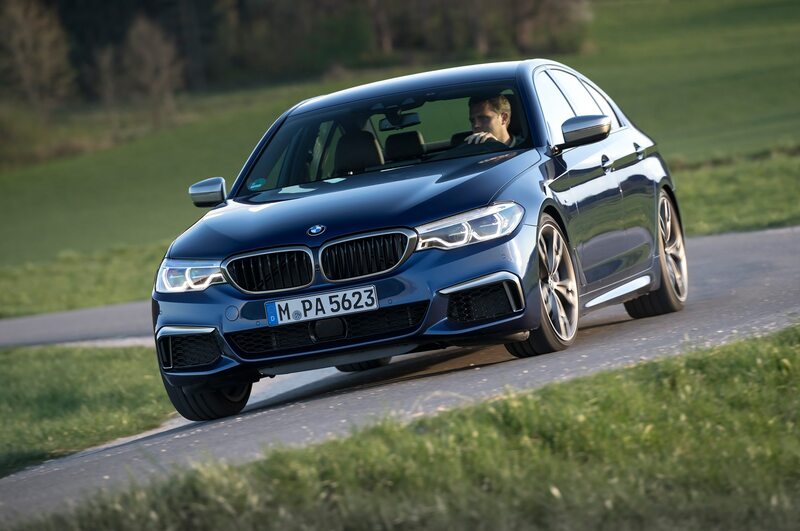 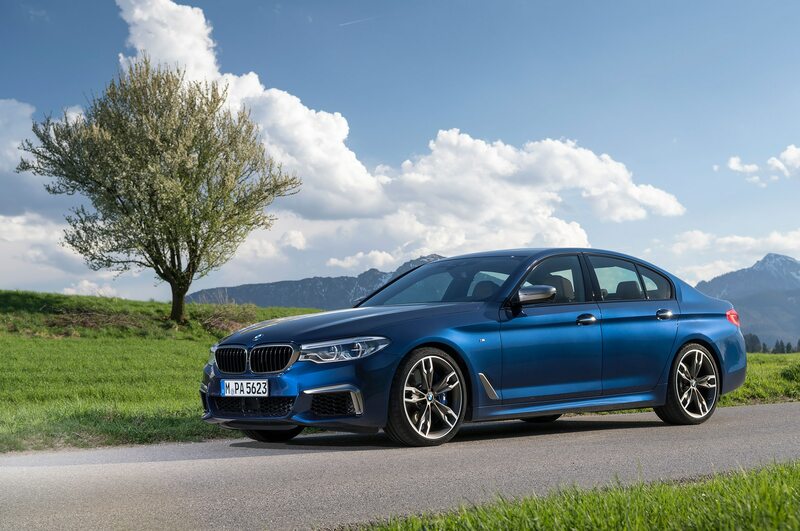 Yes, the numbers are dialed back a bit, but all the basic M5 ingredients are on board: twin-turbocharged and intercooled 4.4-liter V-8, 8-speed automatic with manual shift paddles, and all-wheel drive. 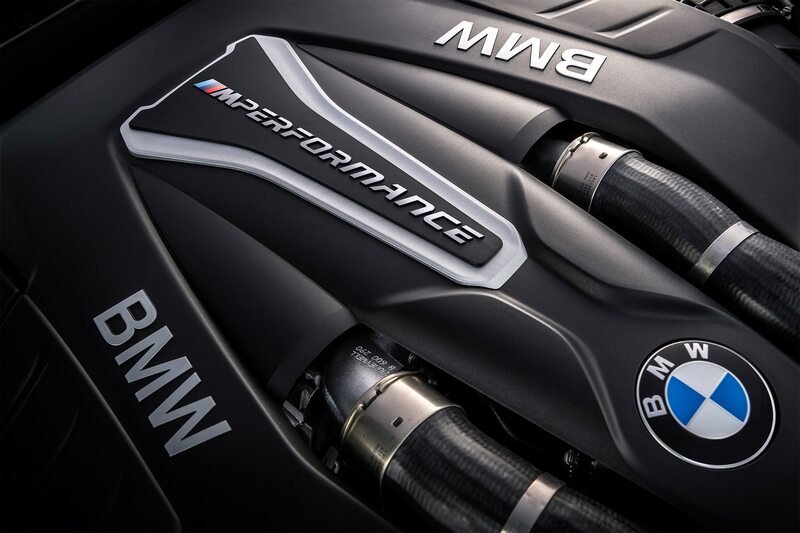 In the M550i’s case, the engine makes “only” 456 horsepower but, hey, that’s still monumental. 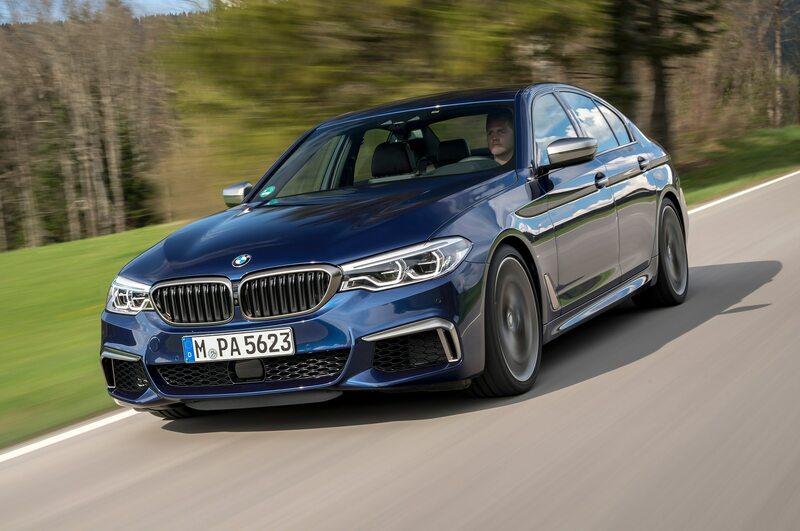 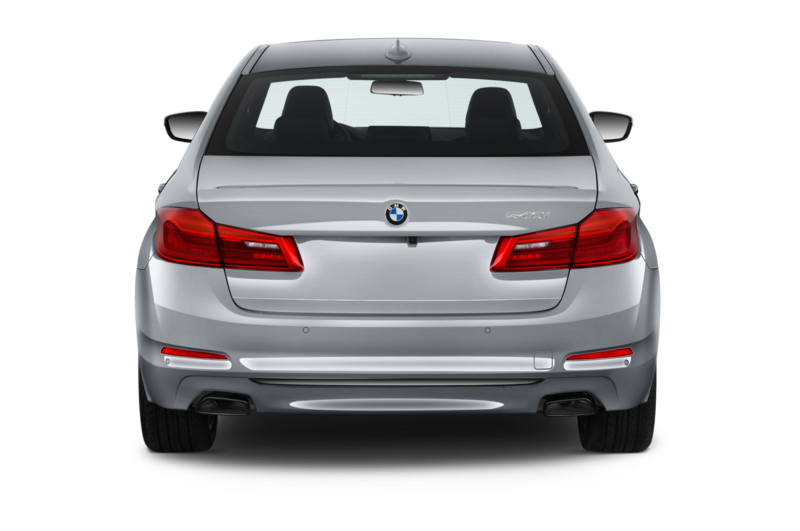 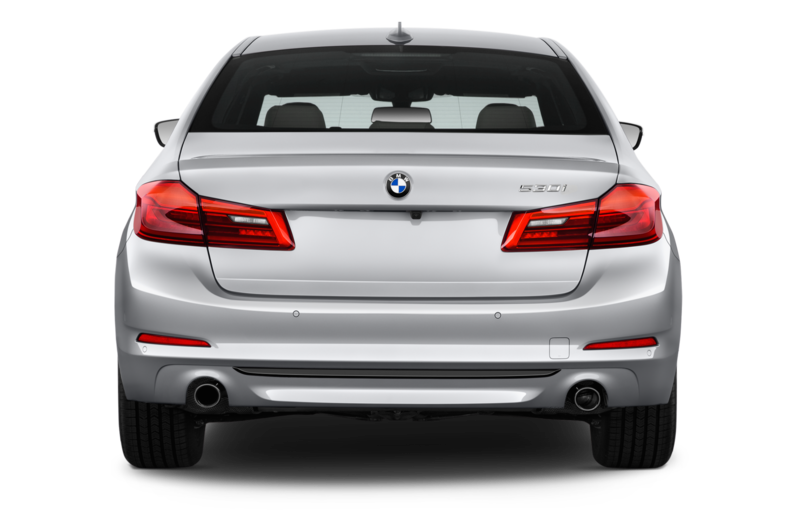 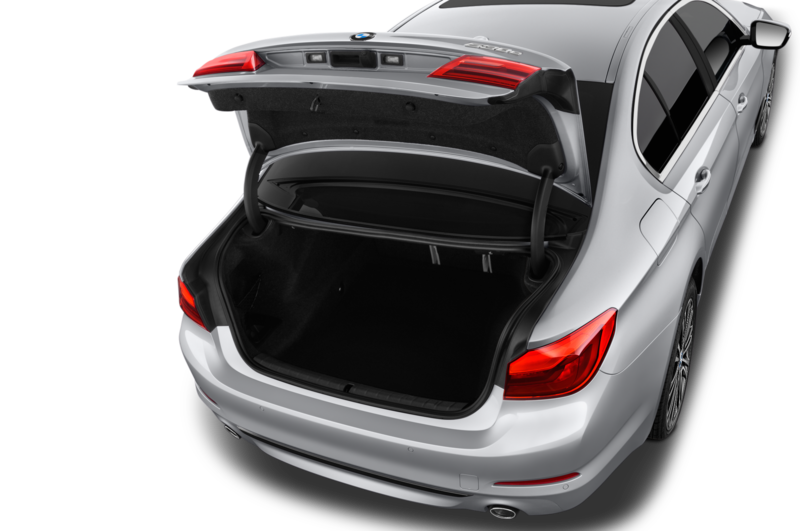 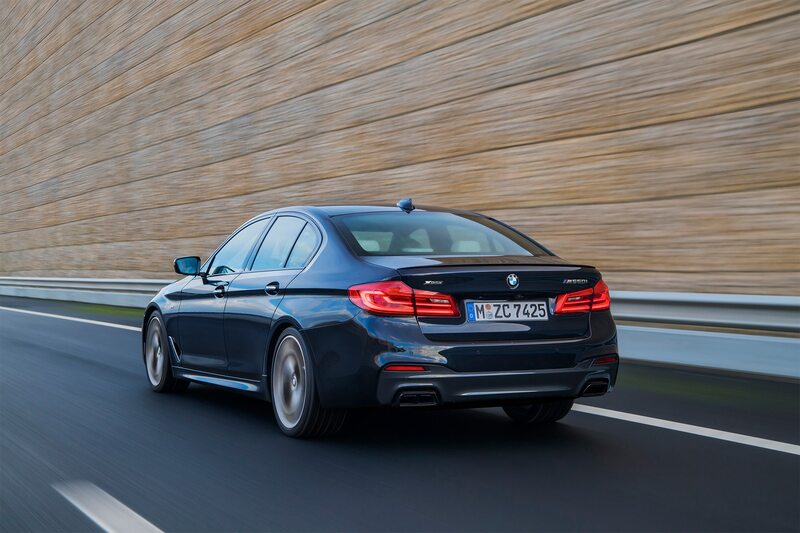 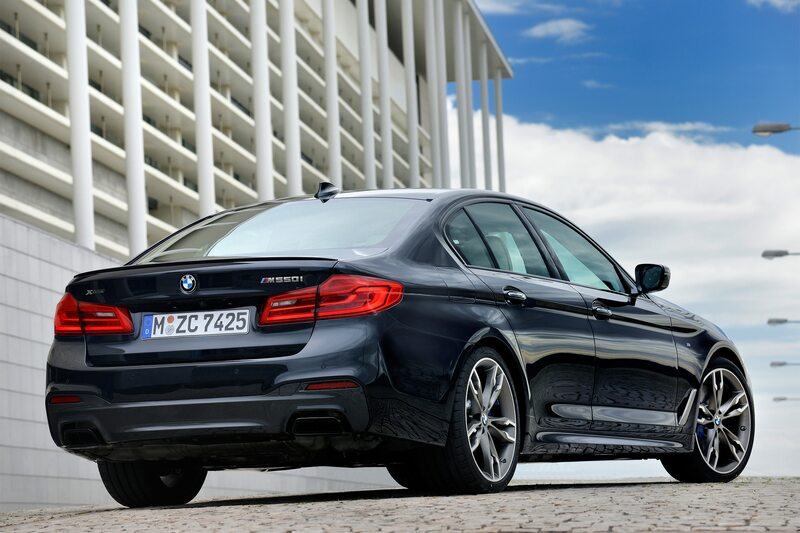 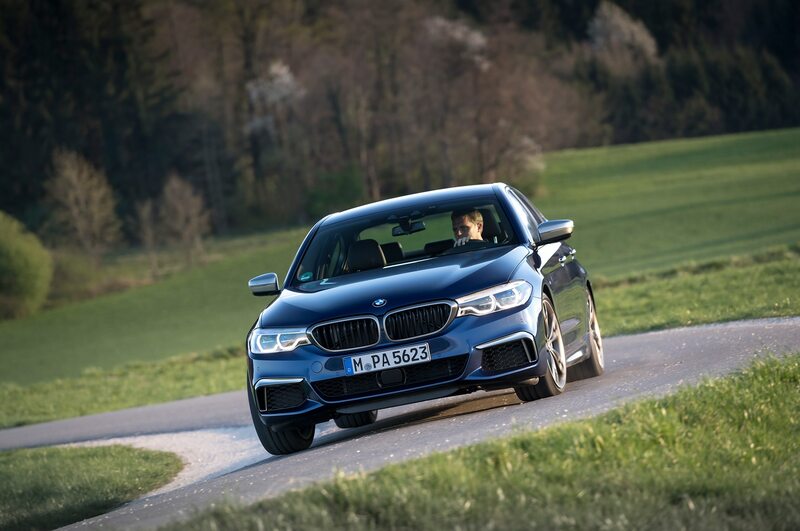 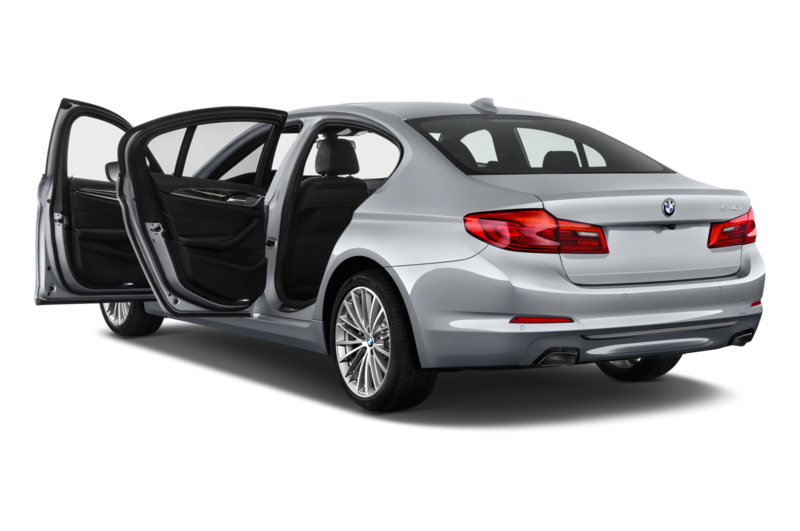 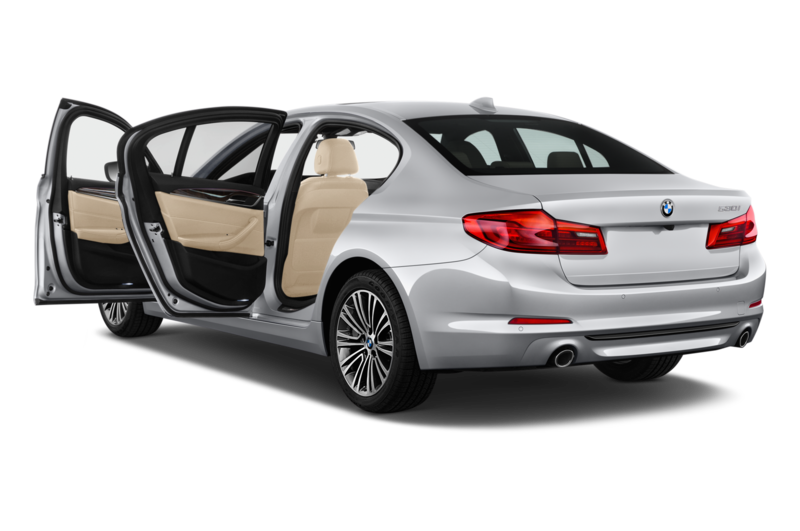 And while the M550i lacks the M5’s Active M Differential (which allows the car to perform entirely in rear-drive mode), its variable all-wheel-drive system is rear-biased. 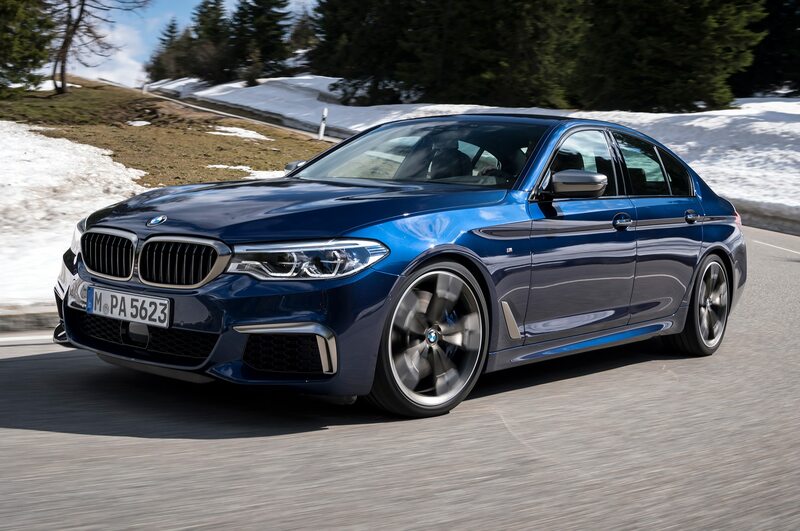 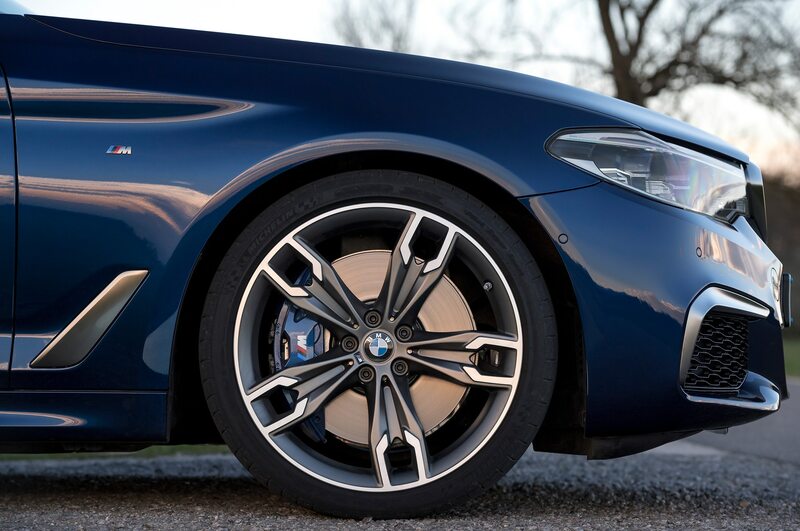 No, it’s not an M5—but make no mistake: This thing is a stormer. 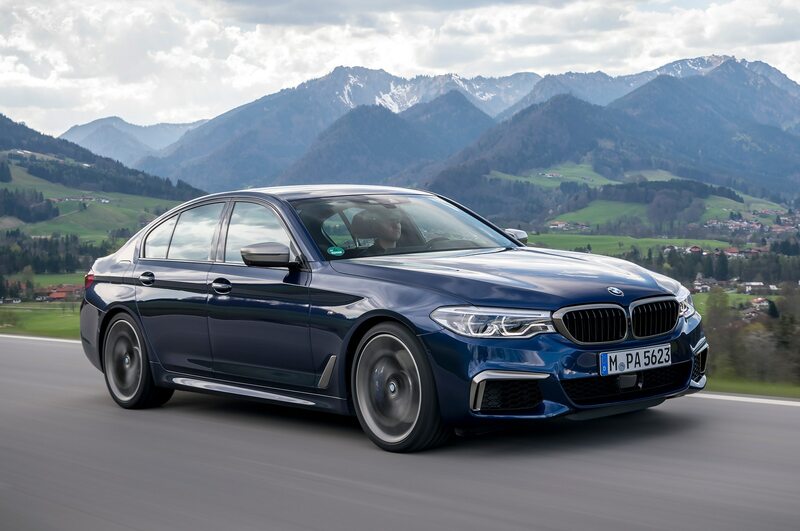 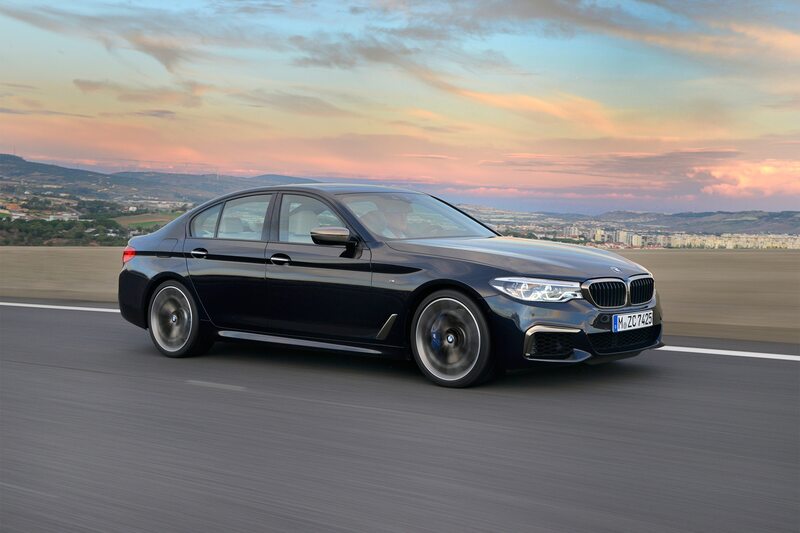 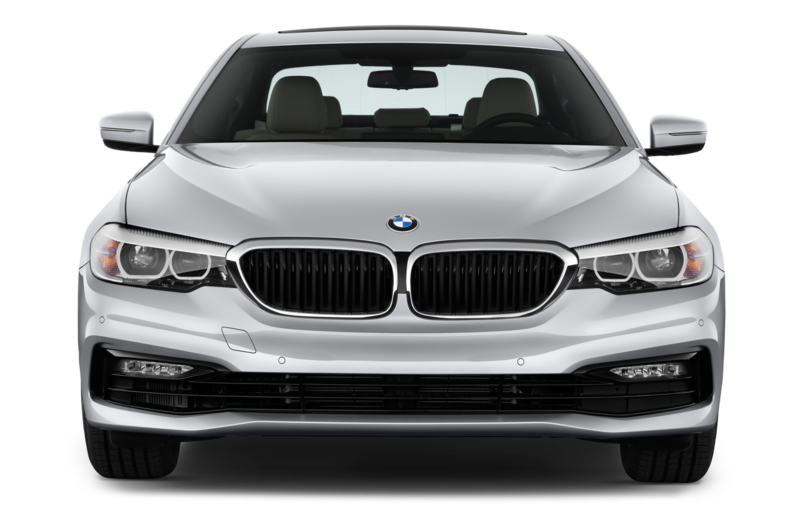 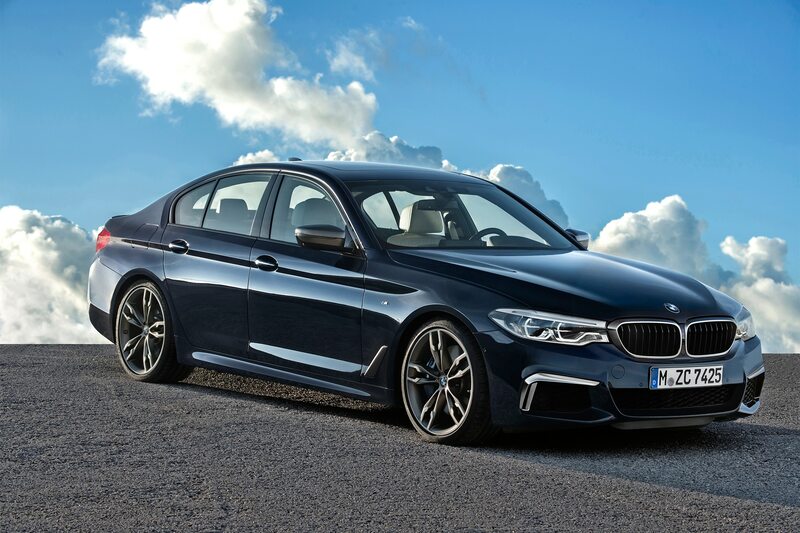 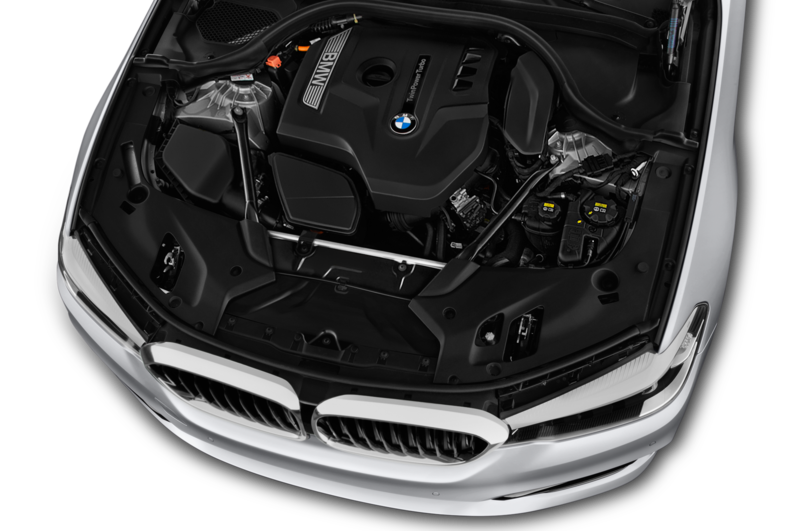 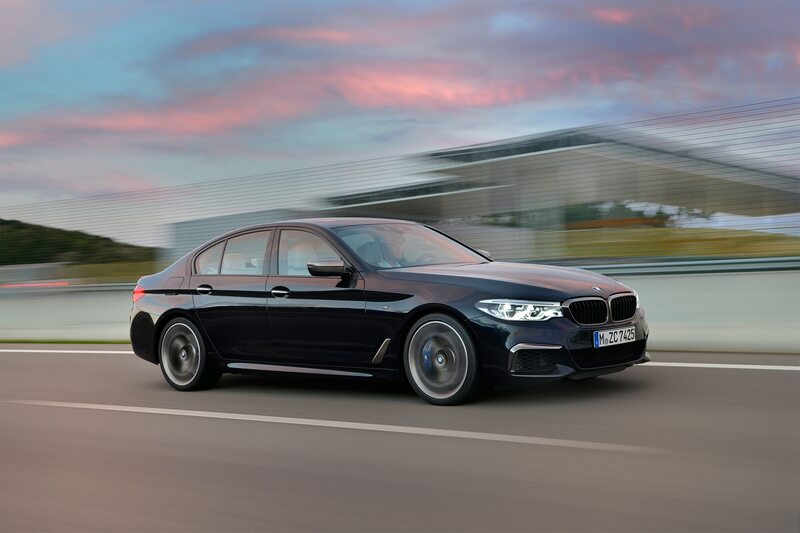 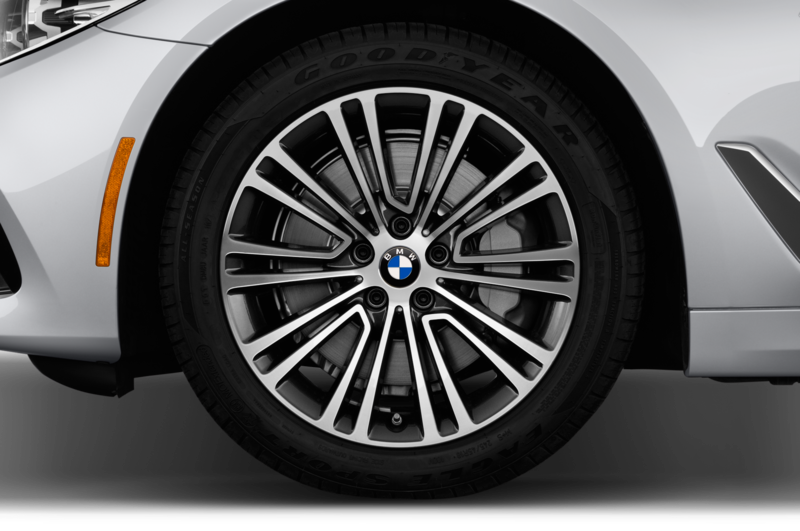 Fed through the outstanding, ZF-sourced 8-speed, the M550i’s 480 pound-feet of torque are fully on duty as low as 1,800 rpm. 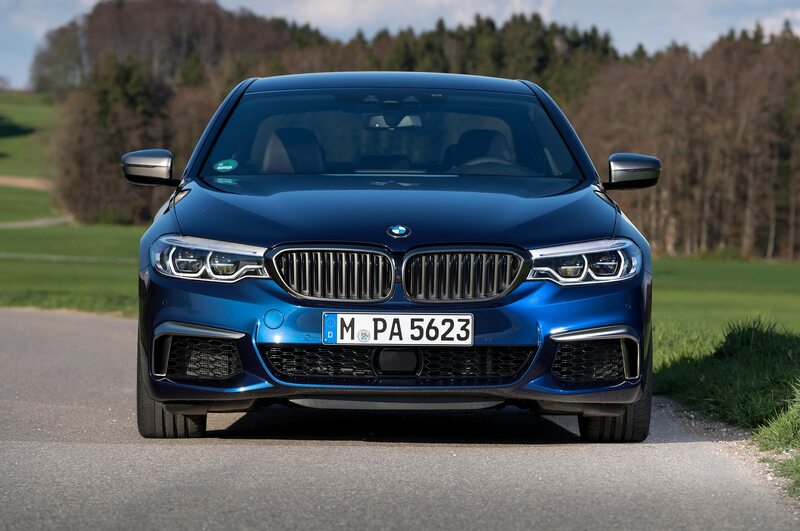 Thus, despite weighing well over two tons, the M550i runs like a cheetah chasing a winning lottery ticket. 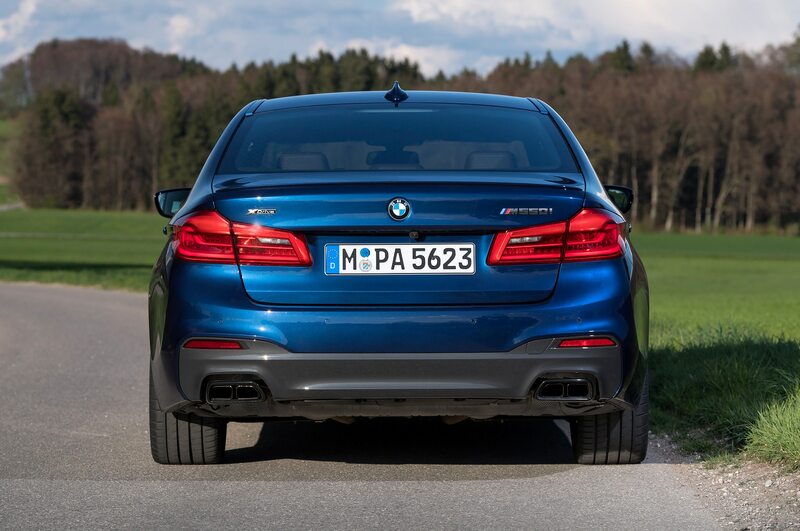 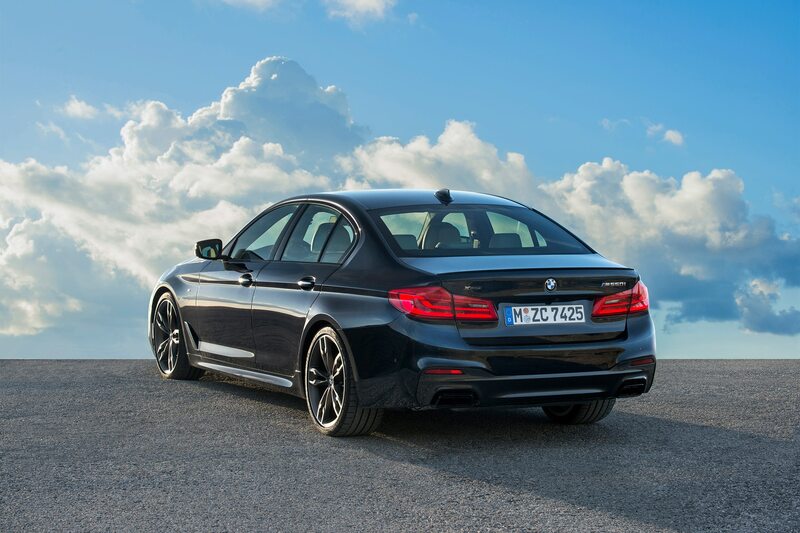 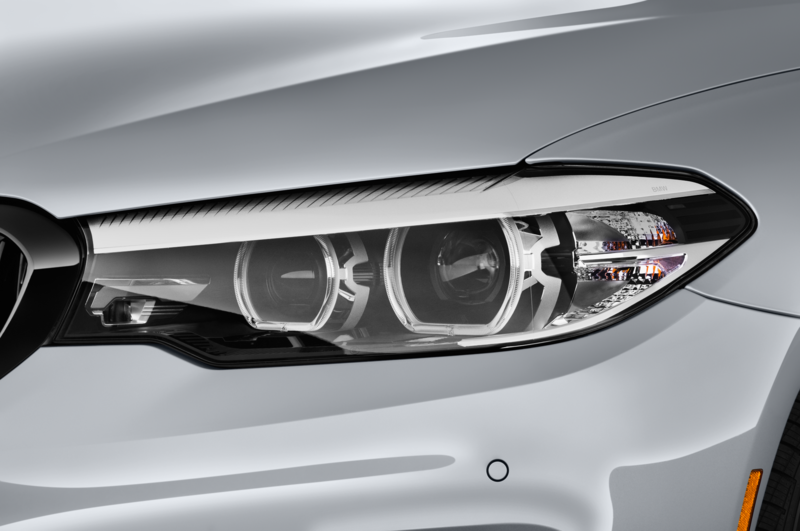 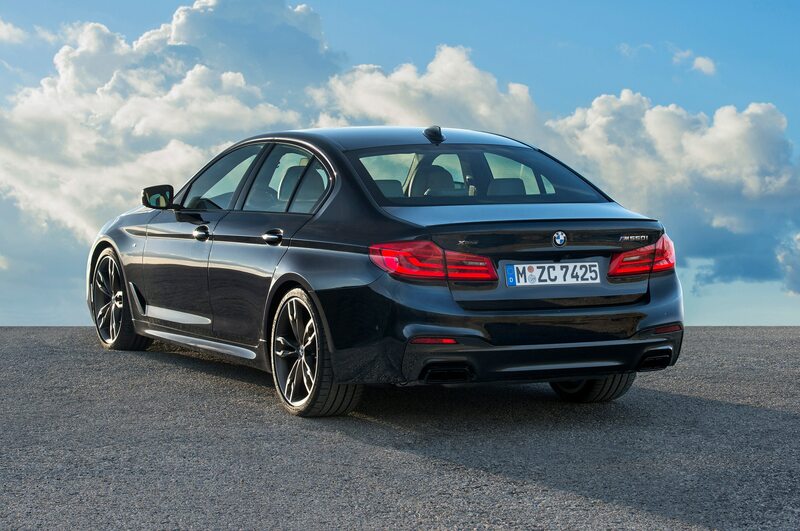 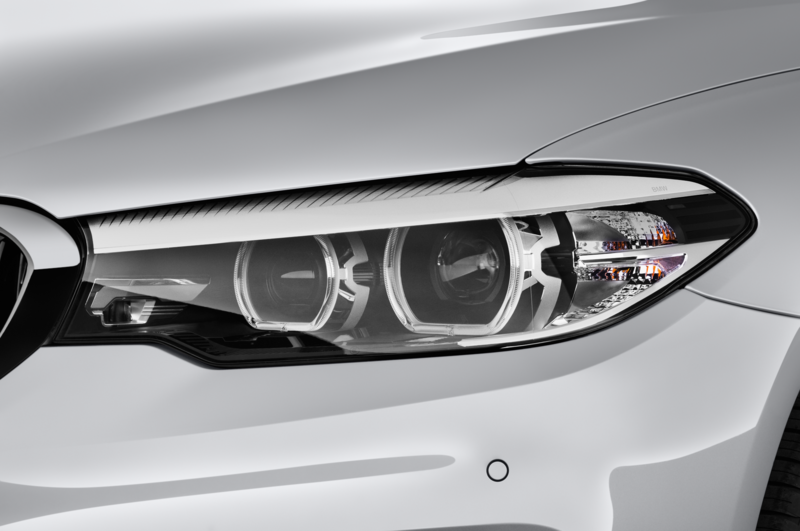 BMW claims a 0 to 60 mph time of under 4.0 seconds, and to me that figure seems conservative. 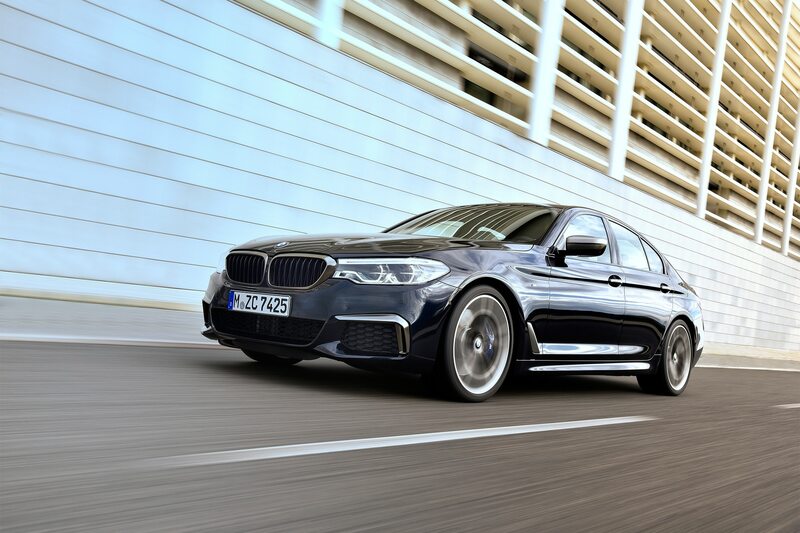 The M550i responds almost telepathically. 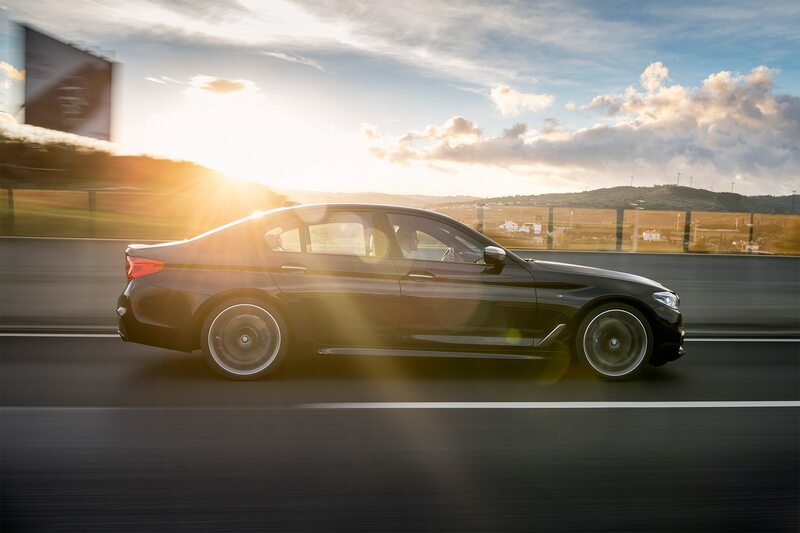 I’d think, “I need to be up there in that lane,” and in an blink—whoosh!—I was. 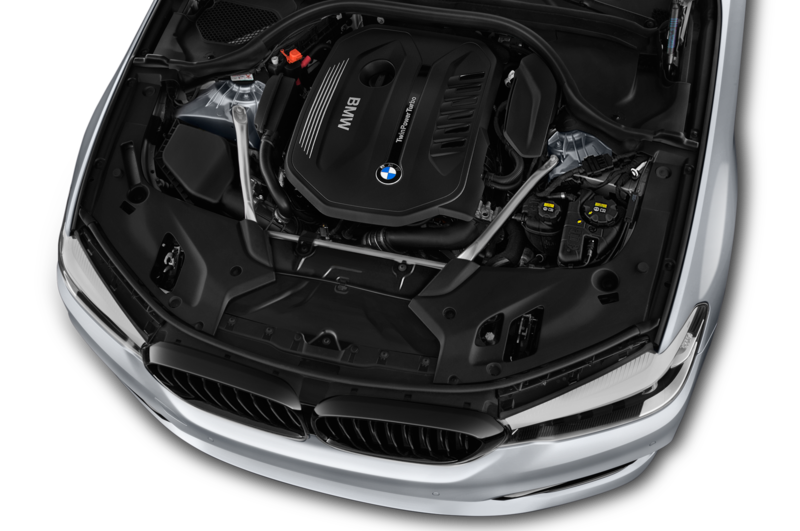 Aided by the traction of the xDrive system, there’s no hesitation and seemingly zero effort—the blown V-8 just gushes with brawn and smoothness at it roars to its 7,000-rpm redline. 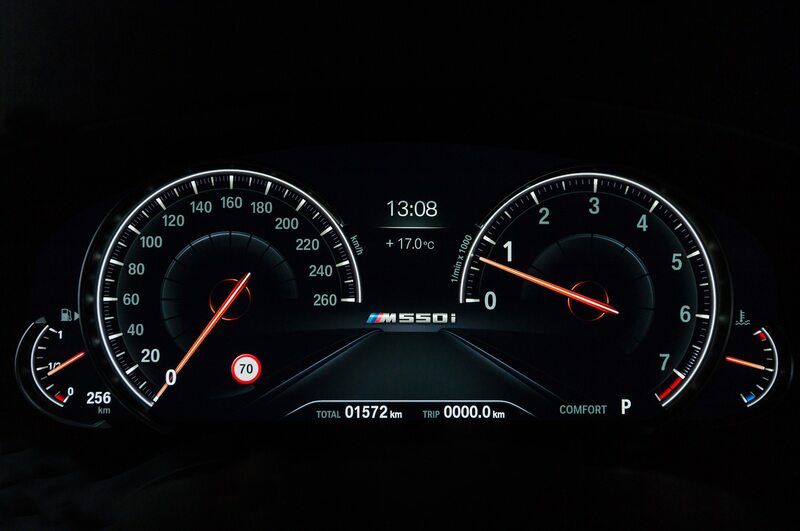 I never got tired of squeezing the right pedal, and even when I wasn’t, it felt immensely satisfying just to think about the performance ready and waiting at the slightest dip into the throttle. 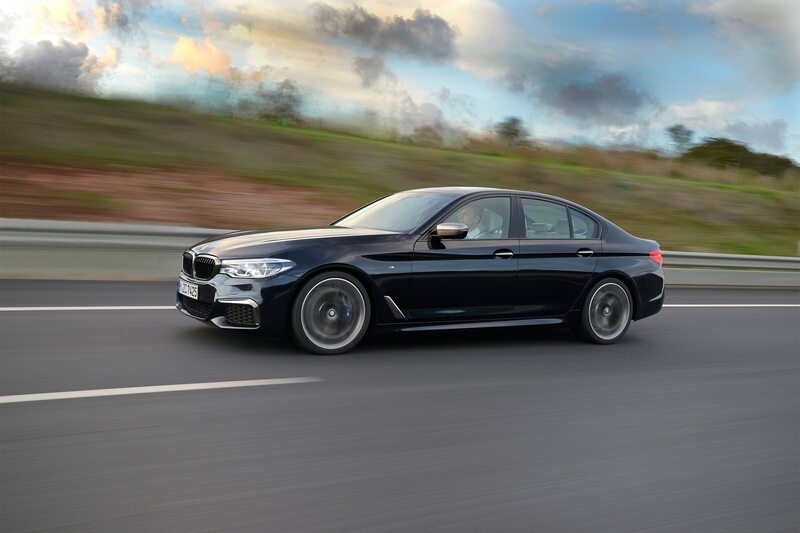 On some of my favorite canyon roads, the M550i proved an agile if somewhat detached athlete. 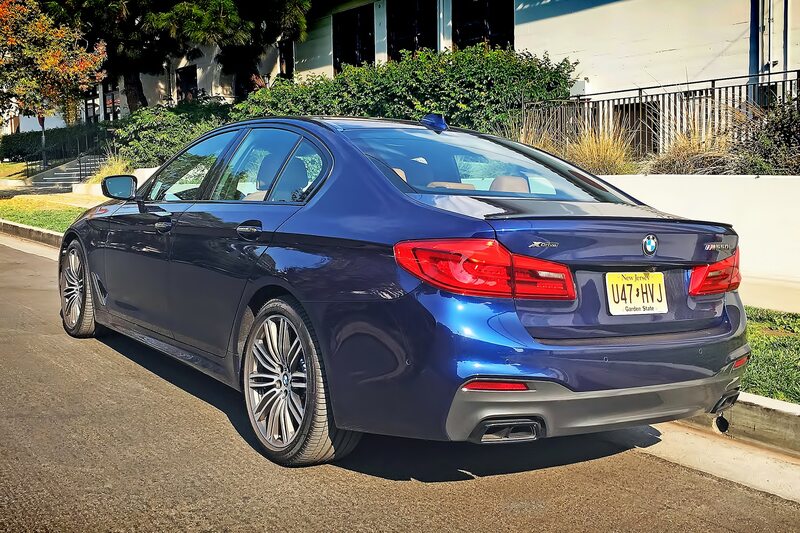 My test car included the optional Dynamic Handling package ($3,600), which adds the Adaptive M Suspension Plus (it lowers the ride height by 10 millimeters) and active roll stabilization. 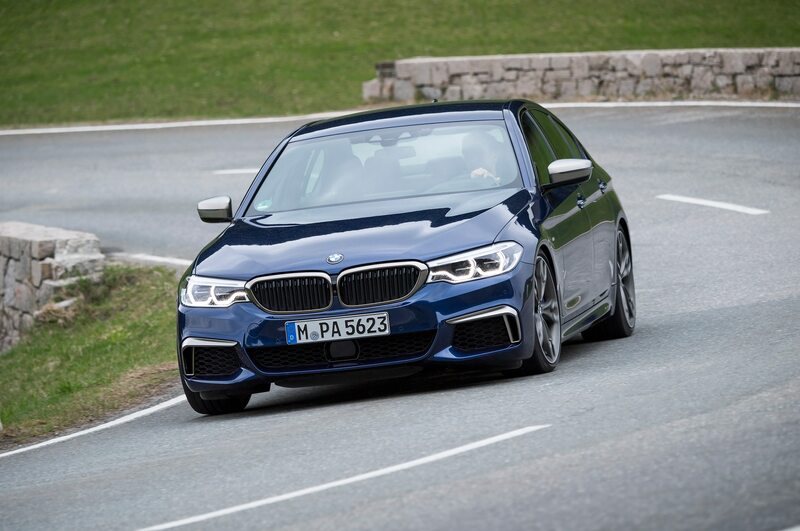 So equipped, the M550i gunned through turns with mega grip and only a modest amount of understeer. 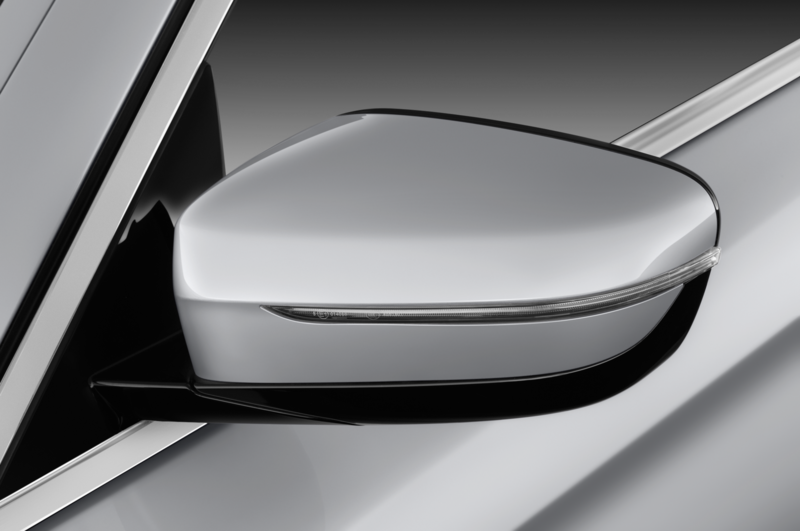 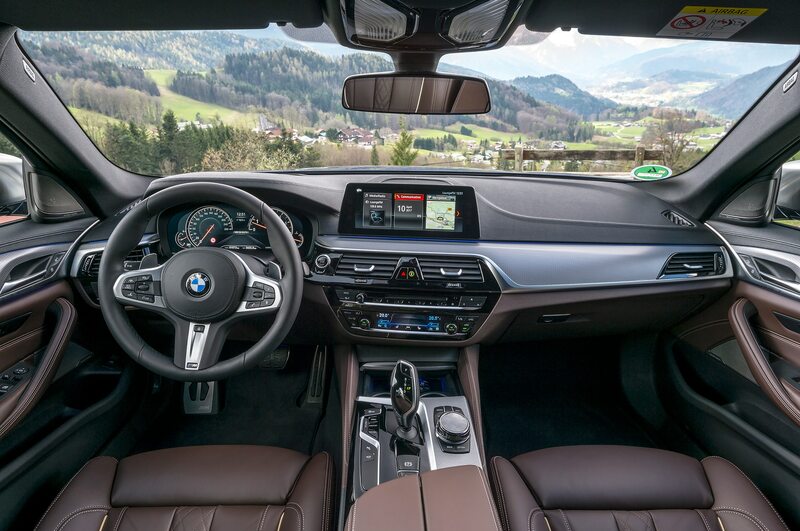 But even in the more aggressive settings (such as Sport+), the car feels decidedly tilted toward comfort over performance. 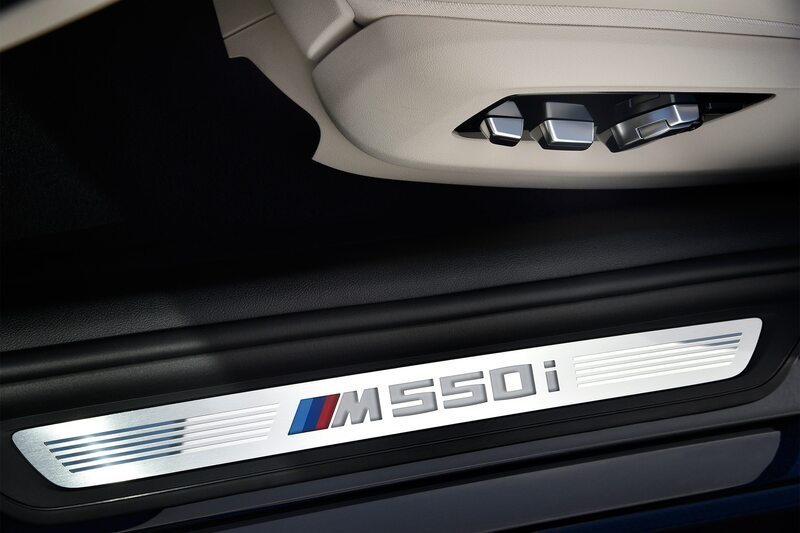 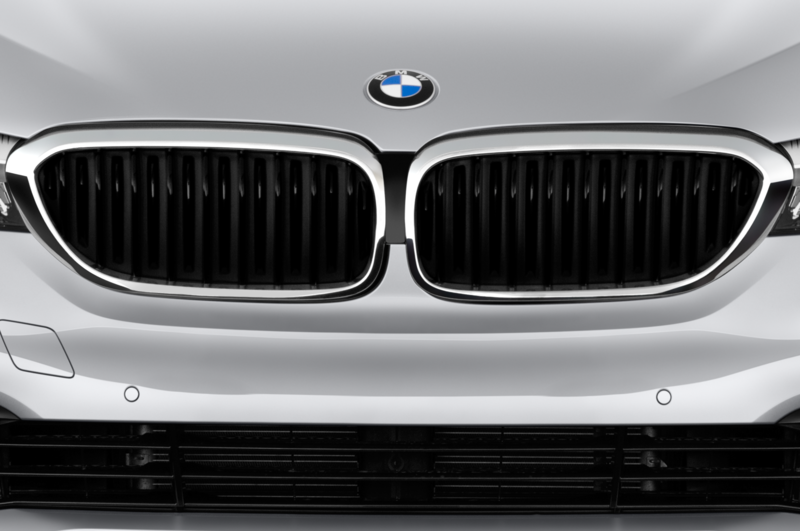 It’s not a scalpel like the M5 is sure to be; it’s a butter knife. 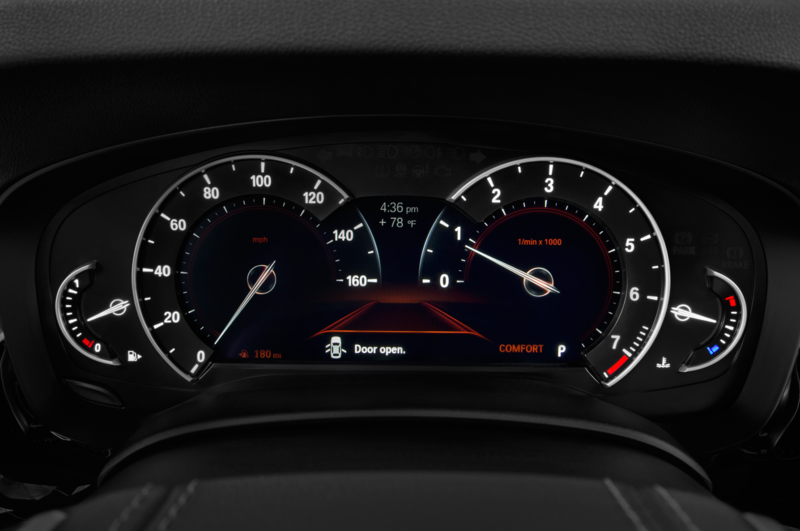 Yet I don’t see that as a bad thing at all. 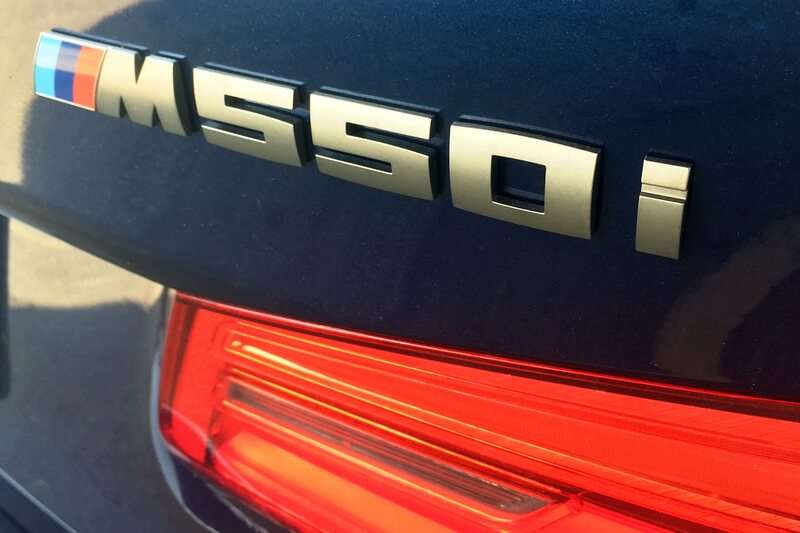 To my eyes, the M550i isn’t a bargain-priced M5; it’s a machine of an entirely different flavor. 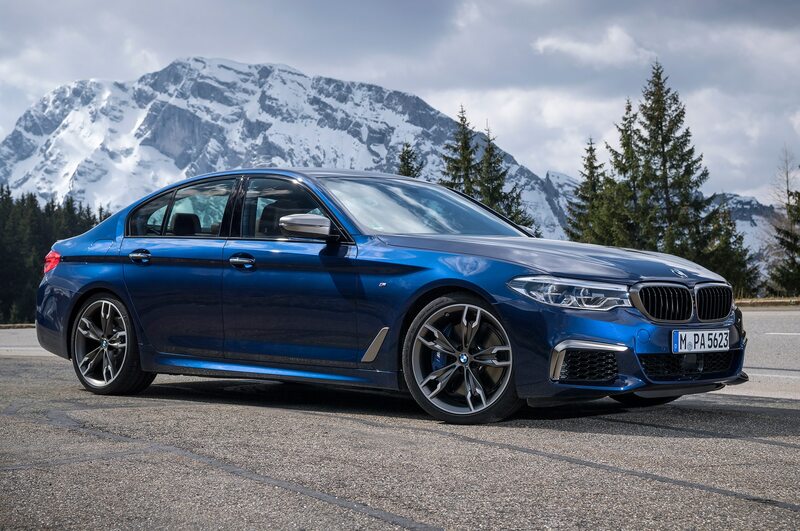 Don’t think “screaming performance sedan,” think “thoroughly refined grand tourer.” Let the buyers who want all-out performance open up their wallets for the ultra-pricey M5. 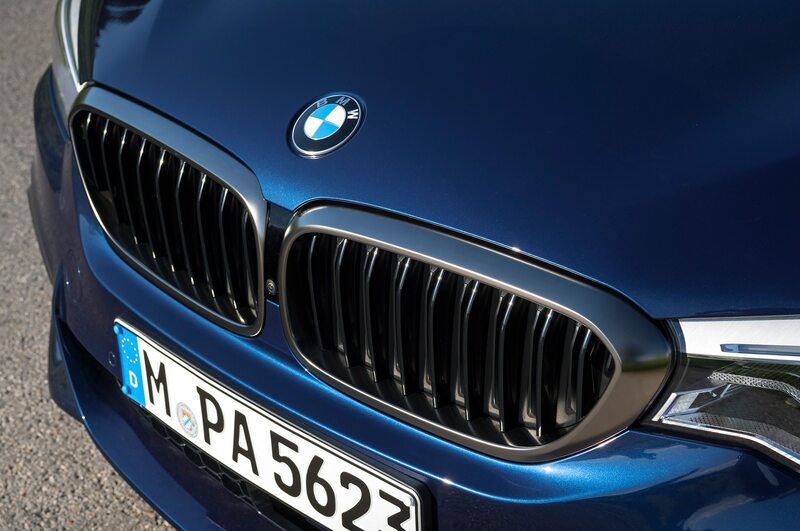 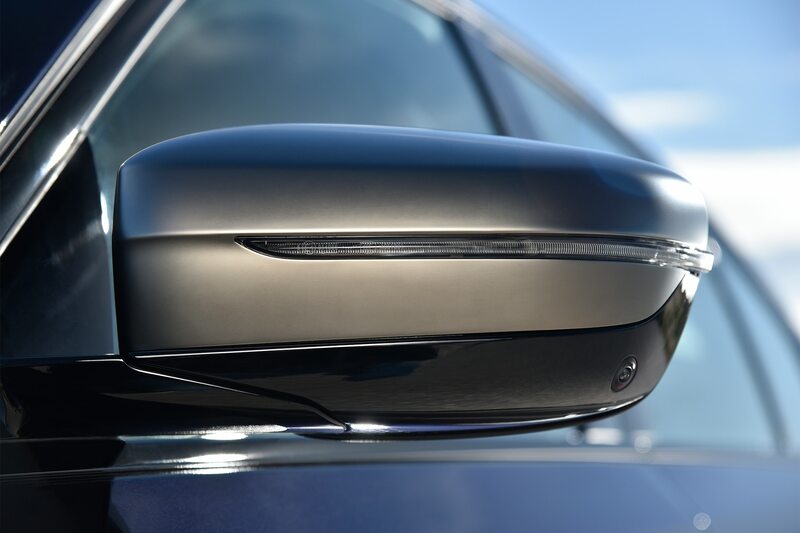 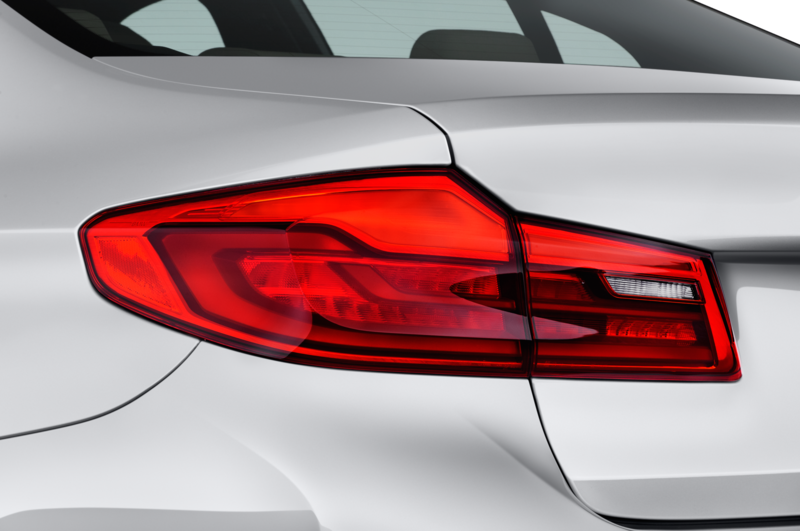 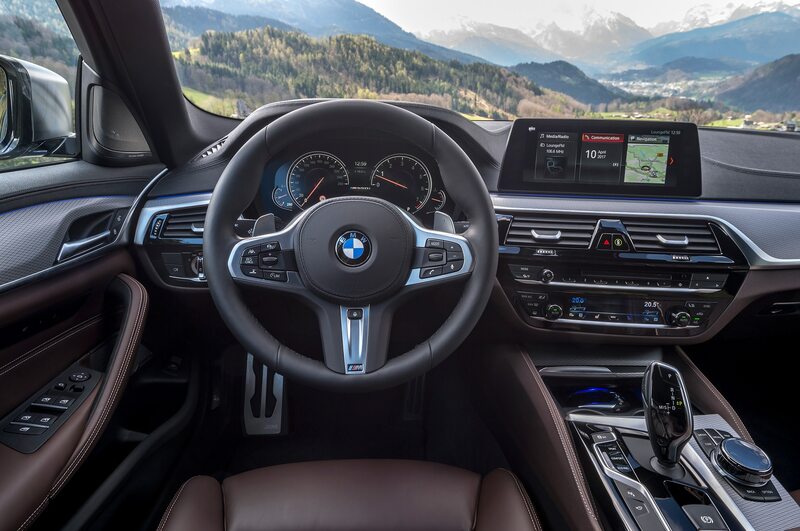 Drivers more interested in prodigious speed with the edges burnished off will find just what they’re looking for in the M550i. I say this because the trade-offs are so obvious as to seem entirely intentional. 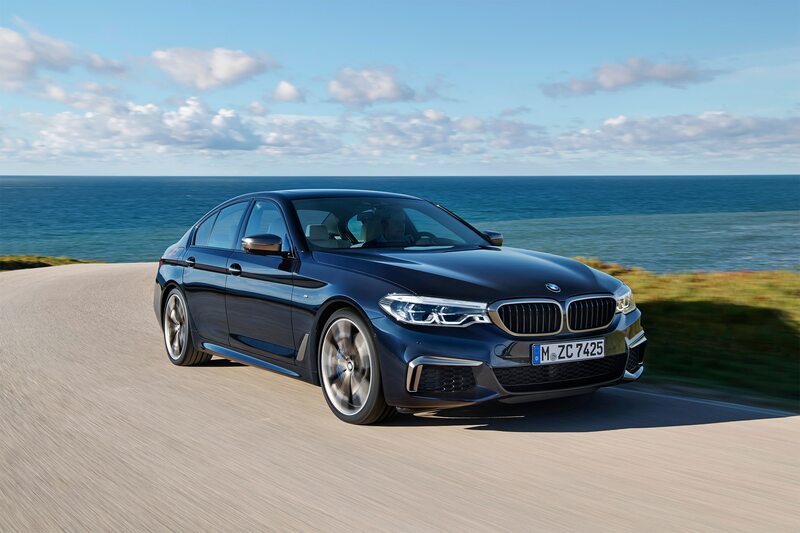 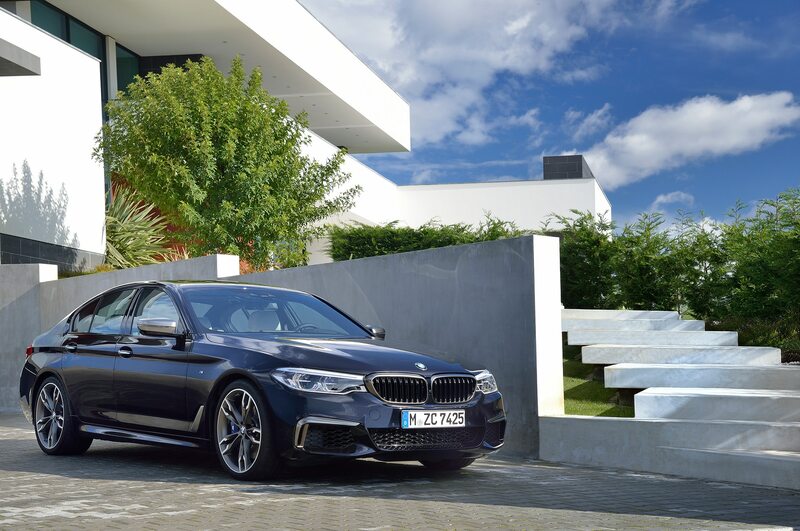 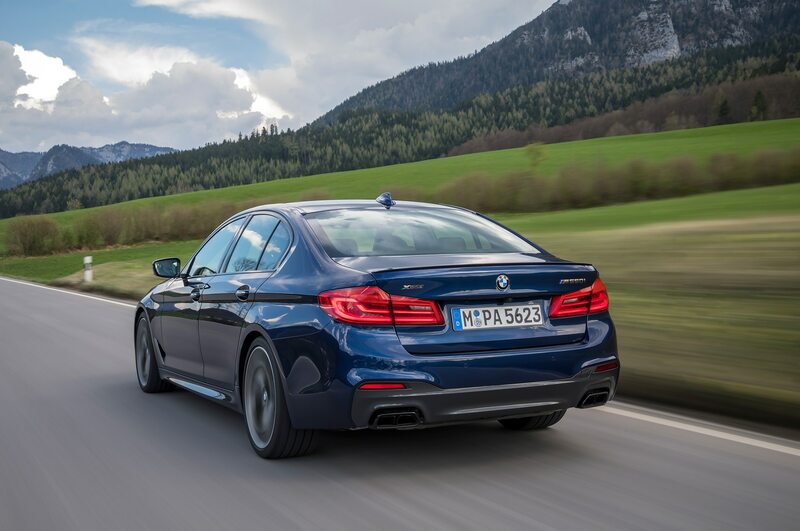 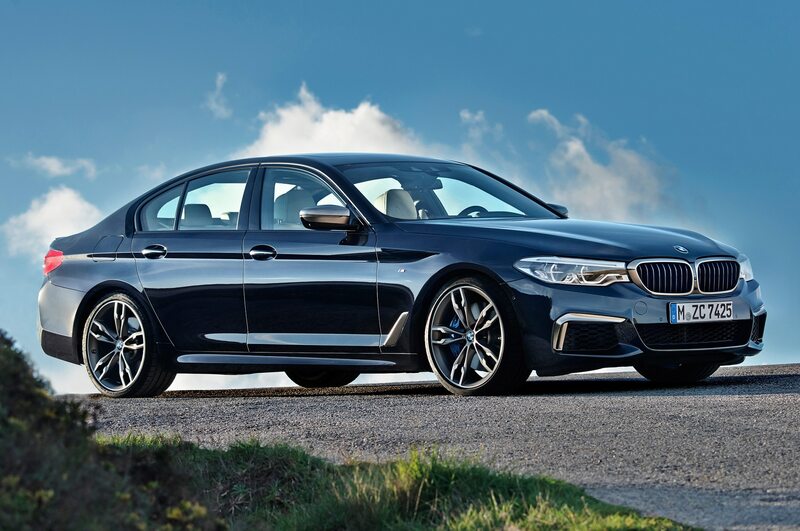 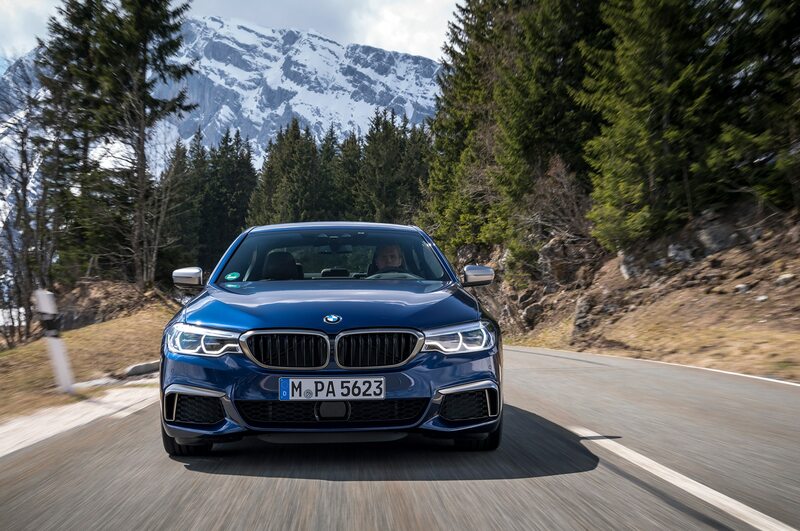 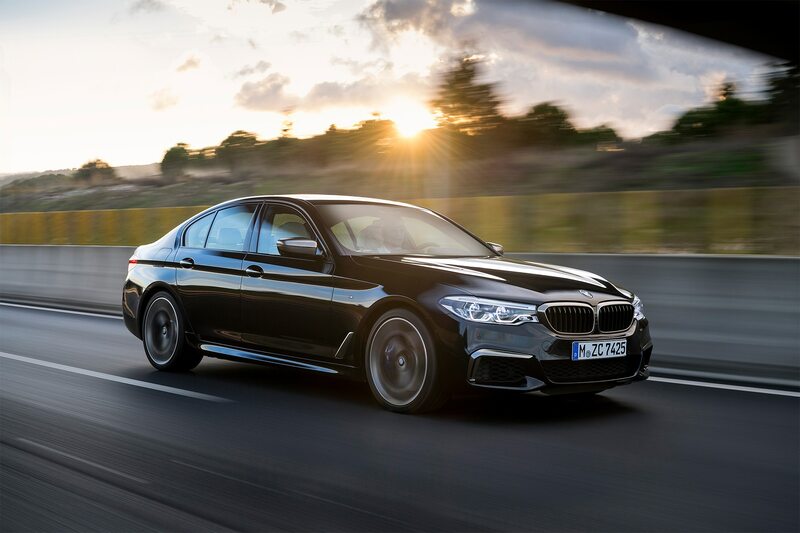 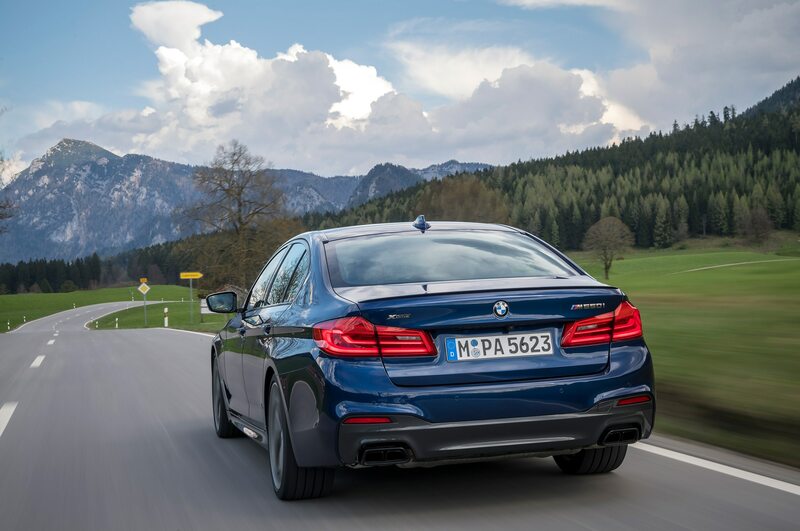 The M5 is clearly bred to deliver heroic handing numbers; the M550i, instead, pampers its fortunate occupants with an unfailingly supple and composed ride (no one with a long commute would honestly prefer an M5 to this more genteel sibling). 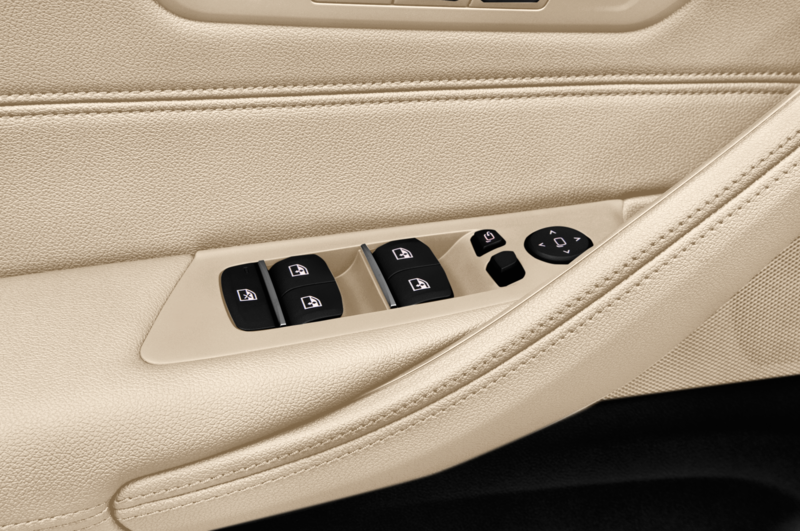 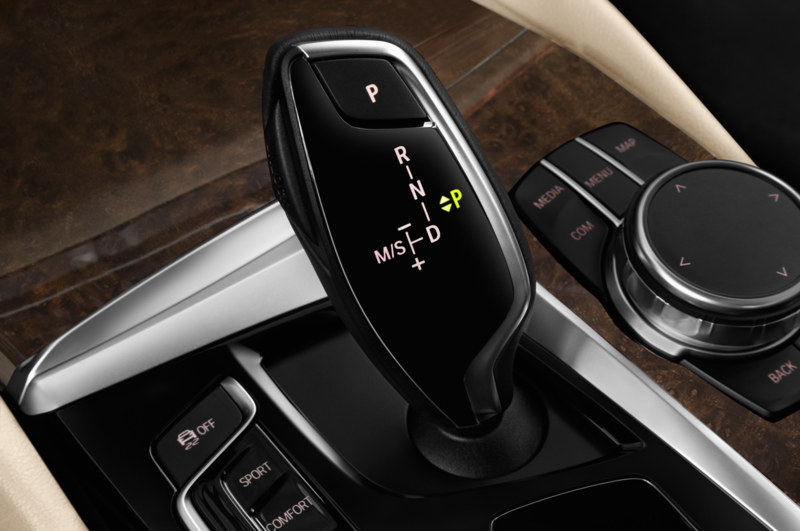 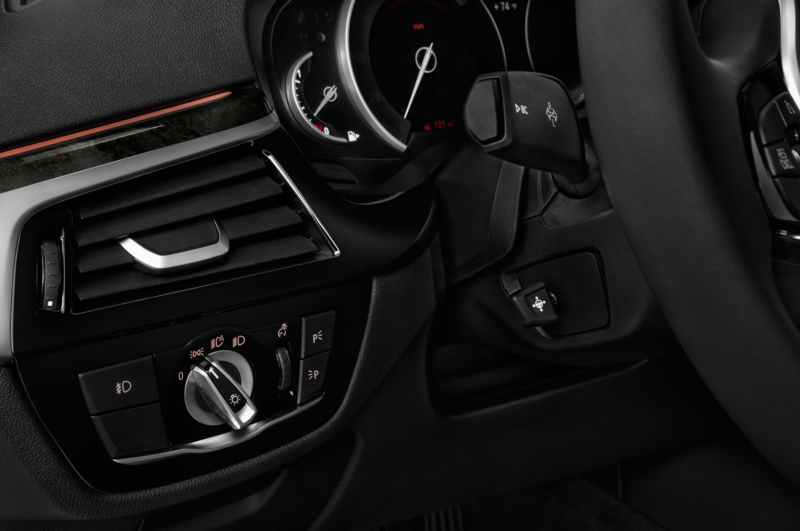 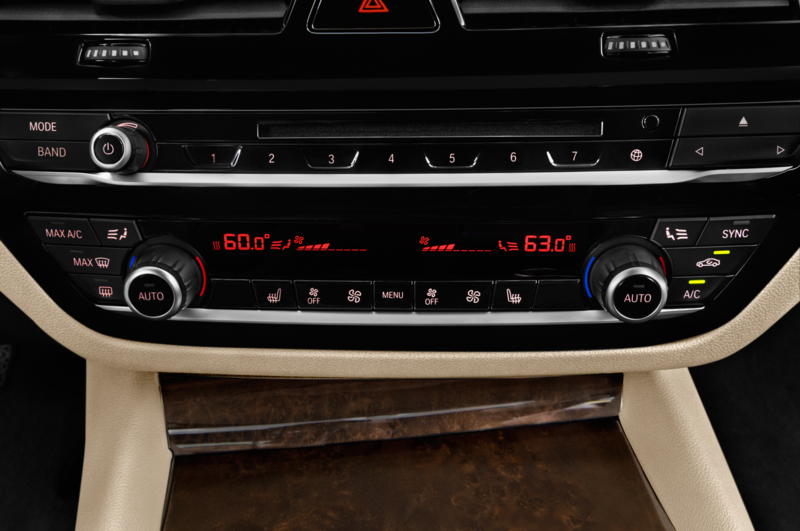 The M550i’s electrically assisted steering is similarly comfort-biased. 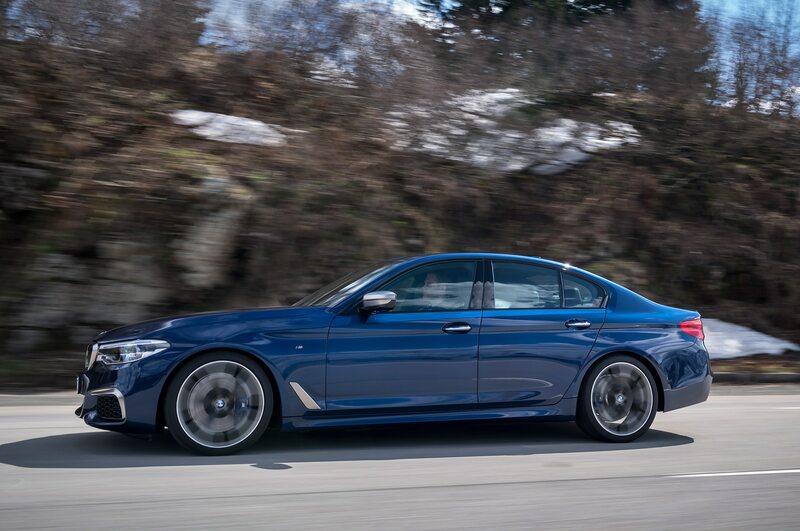 Yes, the car is fully capable of delivering handling moves that will elevate your adrenalin levels, but the steering isn’t alive with feedback or feel. 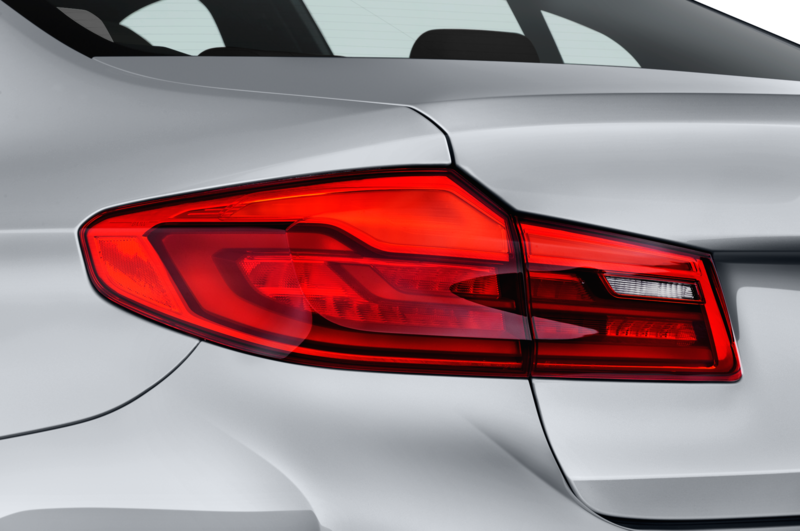 Instead, it’s easy, smooth, light. 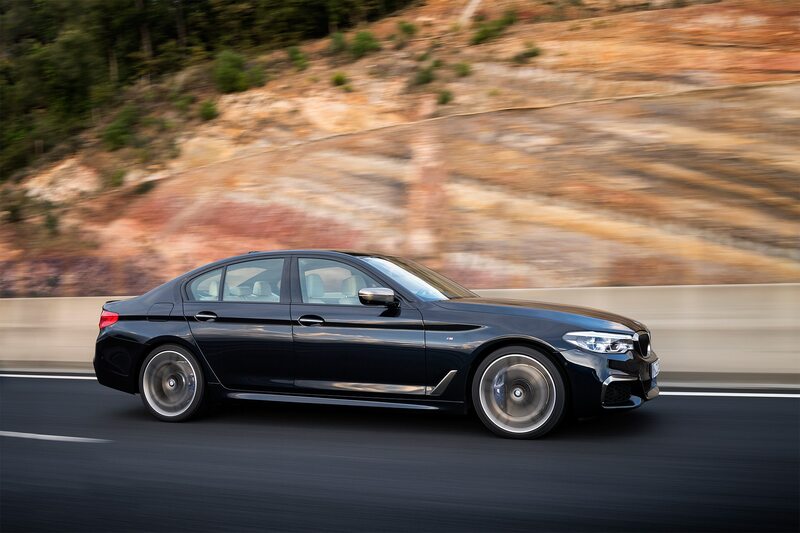 On the highway or in the urban cut-and-thrust, I suspect many drivers would likely prefer its more relaxed character. 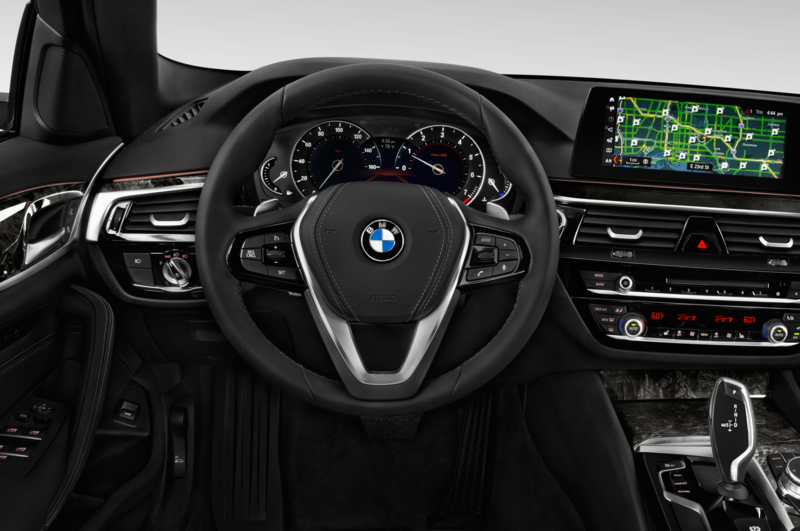 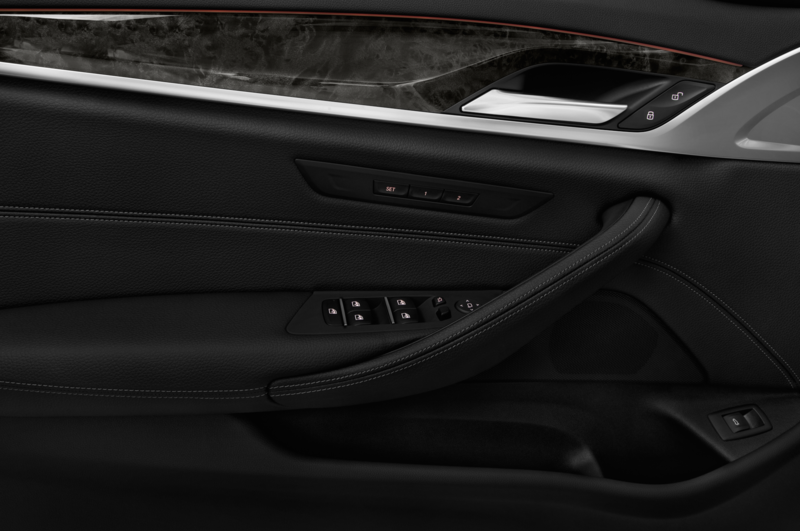 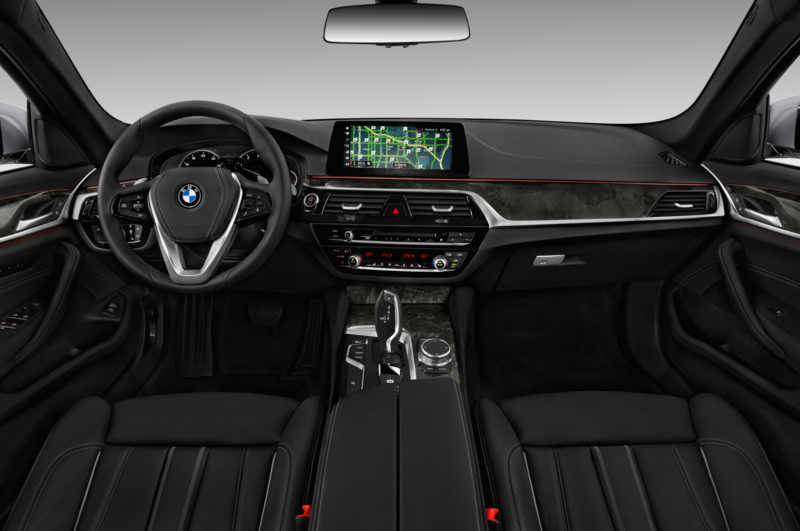 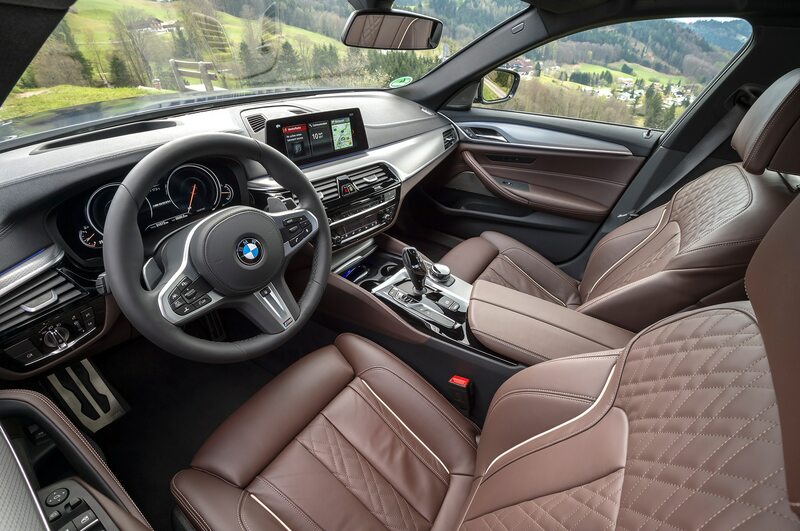 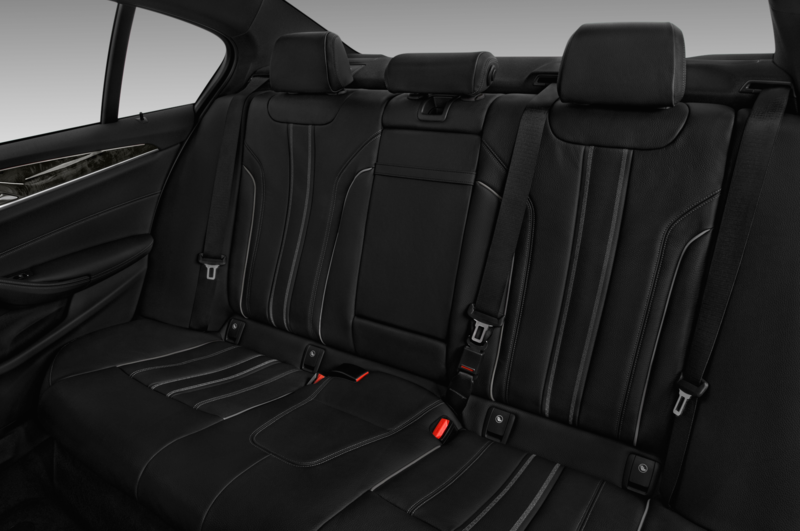 There nothing not to like about the M550i’s cabin. 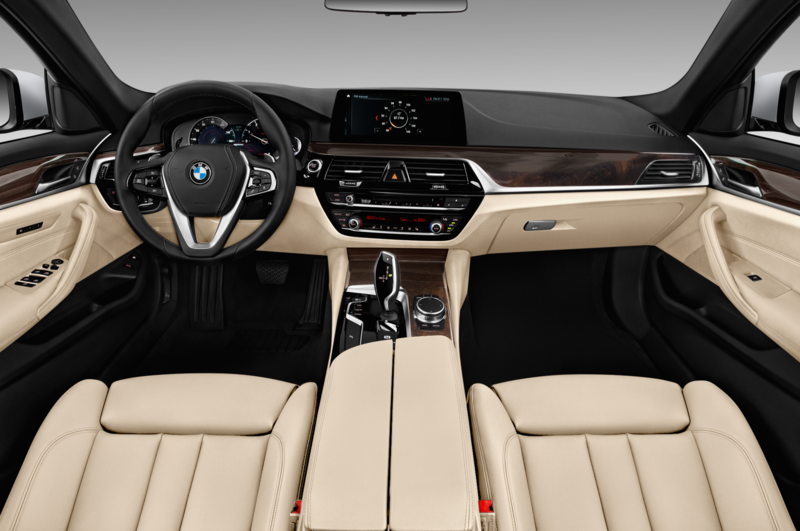 It’s as lovely as it is purposeful. 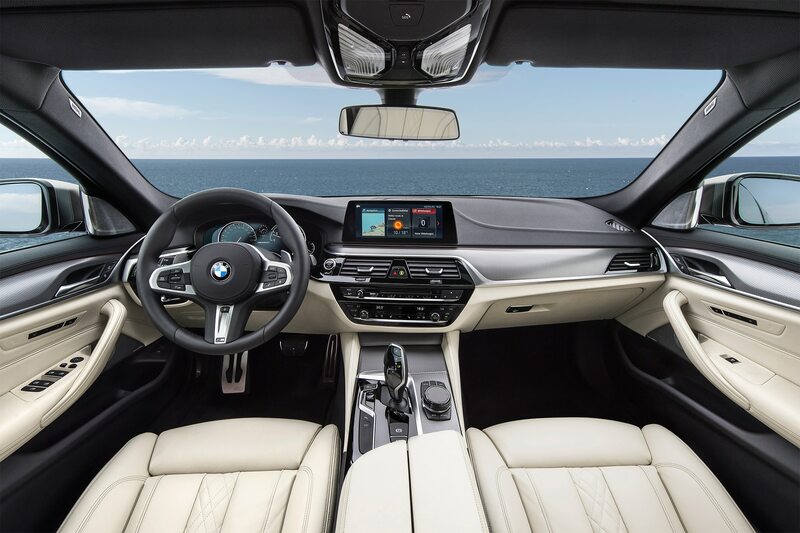 In addition to the rich leather, the cabin is trimmed in classy Fineline Cove matte wood, aluminum trim, and an Anthracite-black headliner. 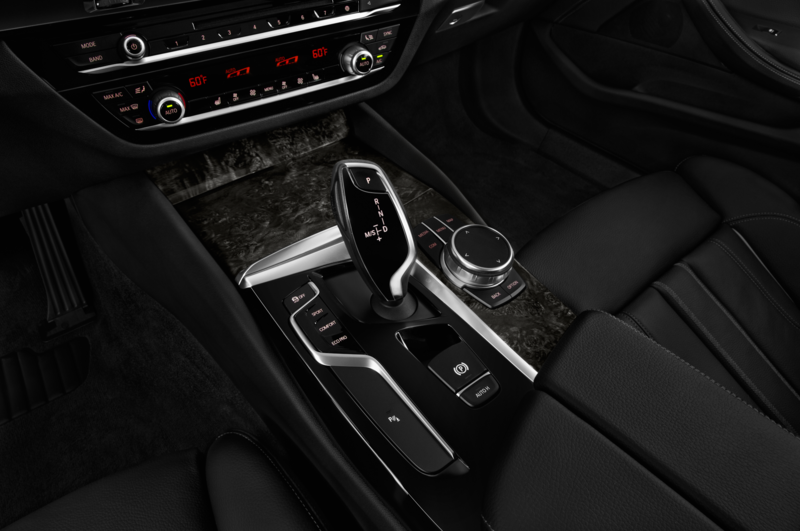 The standard-features list is as long as a Ken Burns documentary: keyless entry, power moonroof, automatic climate control, multi-contour seats, navigation, etc., etc. 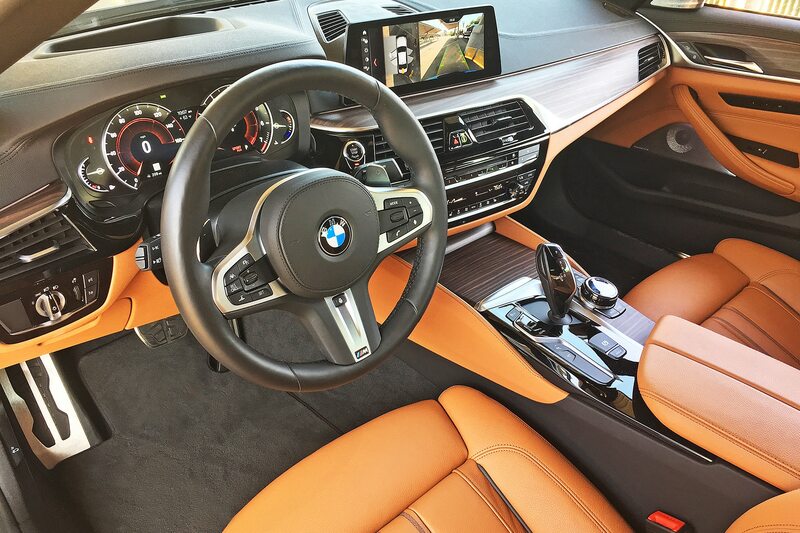 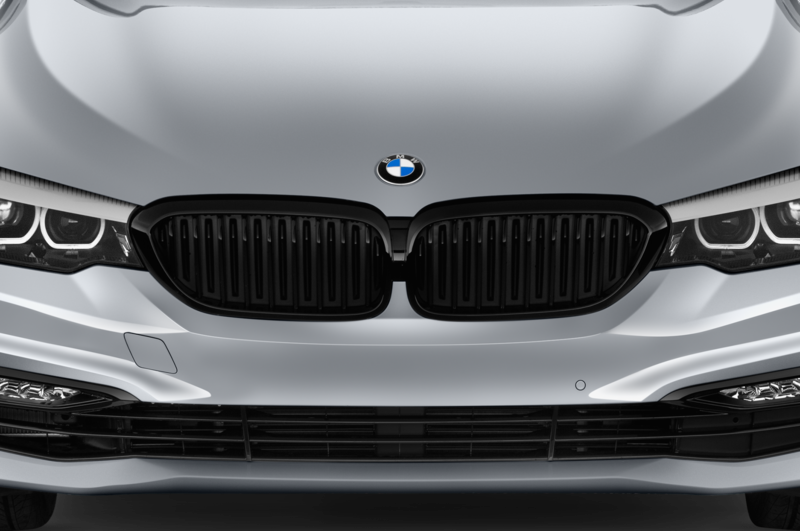 My test car also included a Driving Assistance Plus package ($1,700) with such features as lane-keep assist and active cruise control, a Parking Assistance package ($700) with 3D surround view, Apple CarPlay capability ($300), and a fabulous Bowers & Wilkins premium audio system ($3,400). 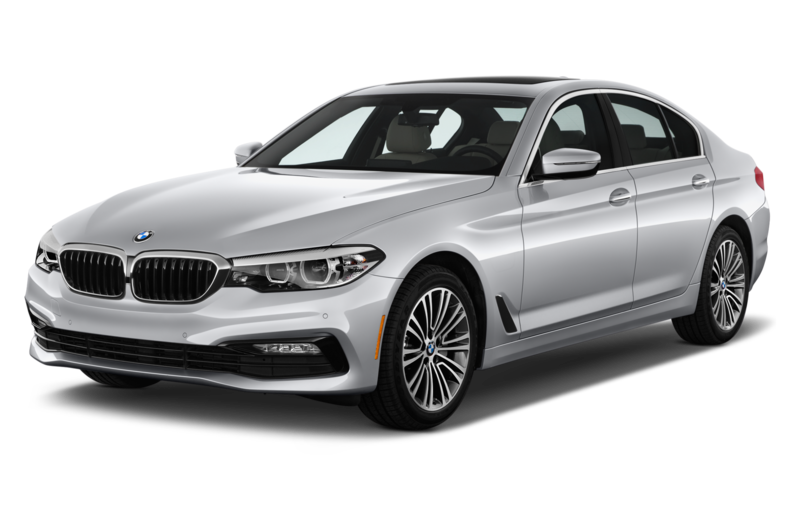 Total tab: $86,685. 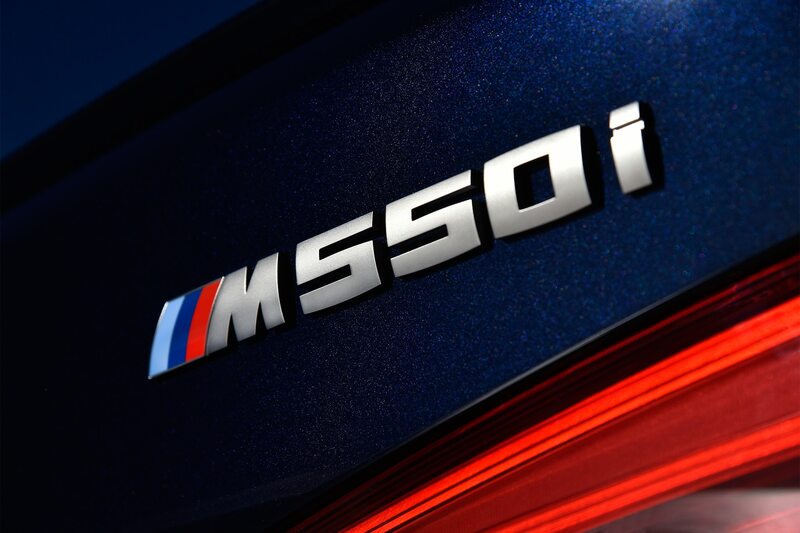 The moniker “fastest 5-Series ever made” will be a quickly fading memory when the mighty M5 roars onto our shores in a few months. 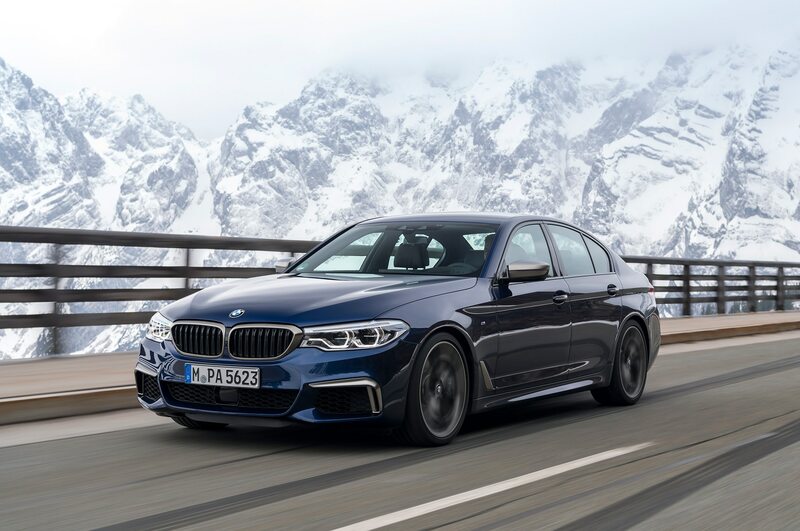 But the M5 is likely going to sell for around six figures—to start—and its ultimate-performance-above-all persona won’t be for everyone. 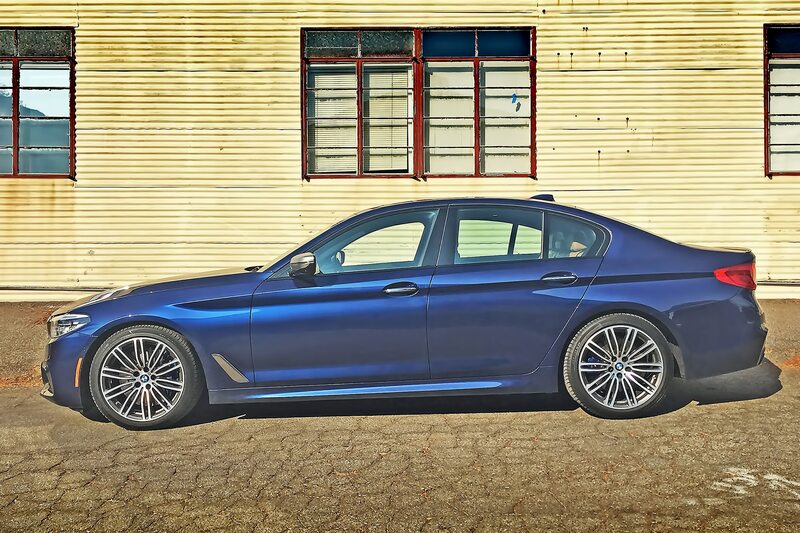 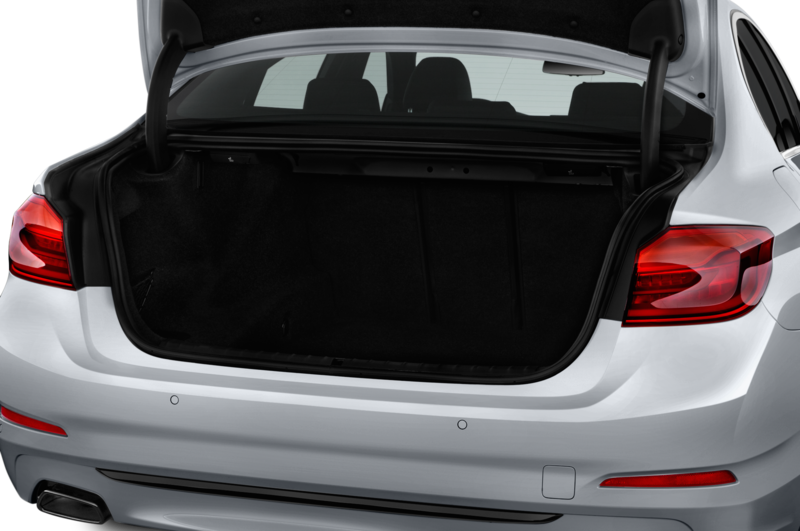 That’s where the M550i xDrive so naturally steps in. 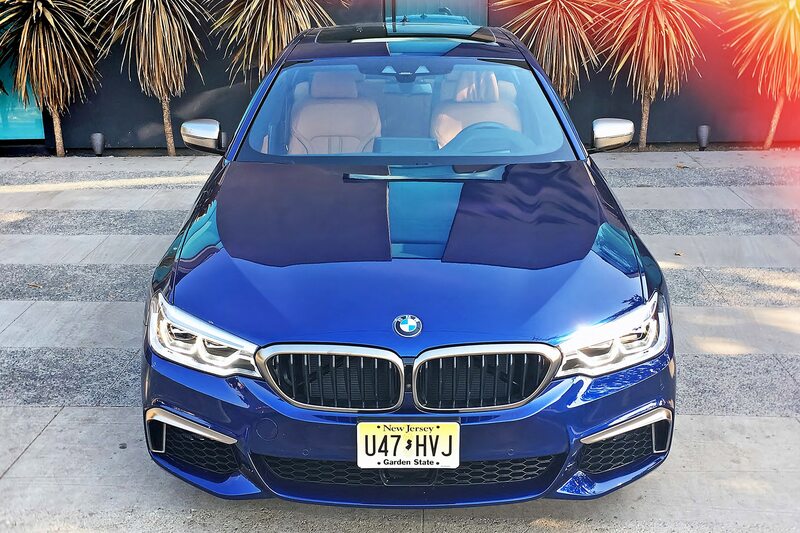 It’s monumentally fast, does a deft job of delivering handling grins without beating up your backside, lacks nothing in luxury appointments or convenience features, and starts at slightly over $73K. 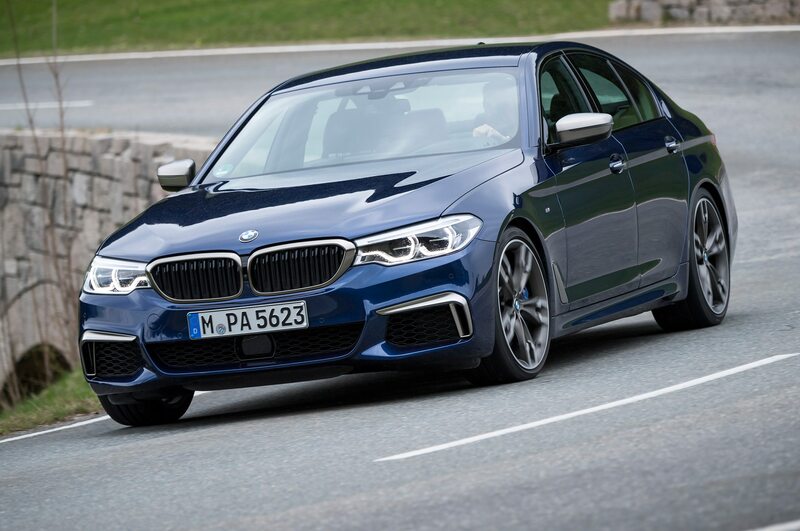 Call it an “M5 Lite” if you will—but, really, it’s a sports sedan all of its own.